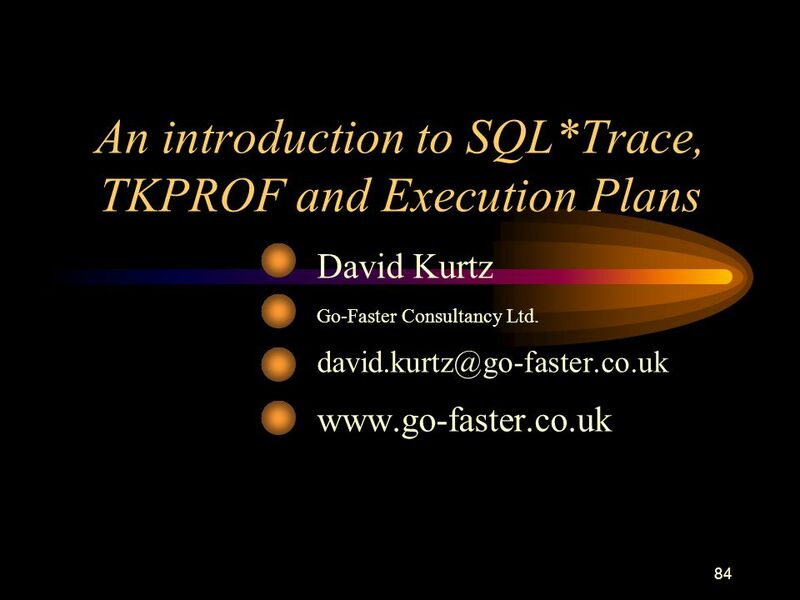 David Kurtz Go-Faster Consultancy Ltd. An introduction to SQL*Trace, TKPROF and Execution Plans Go-Faster Consultancy Ltd.
2 Resources If you can’t hear me say so now. Please feel free to ask questions as we go along. 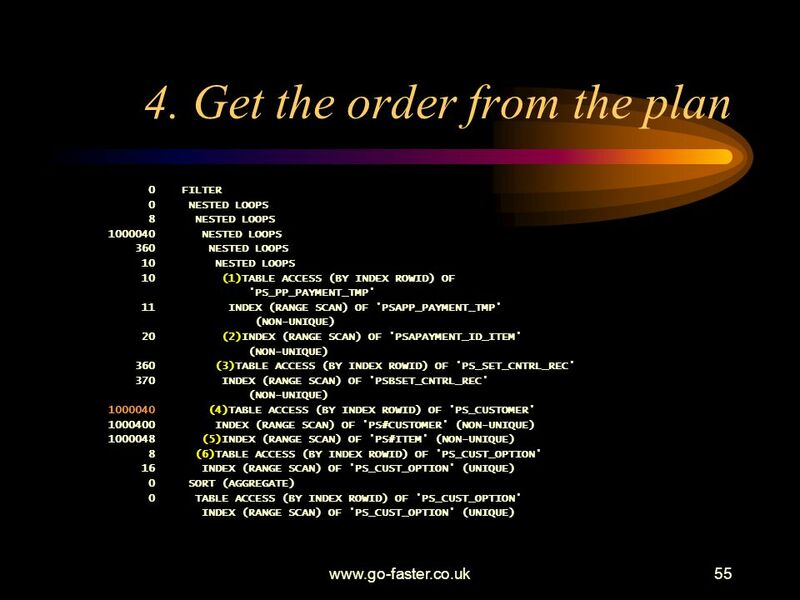 The presentation will be available from Go-Faster Consultancy Ltd. 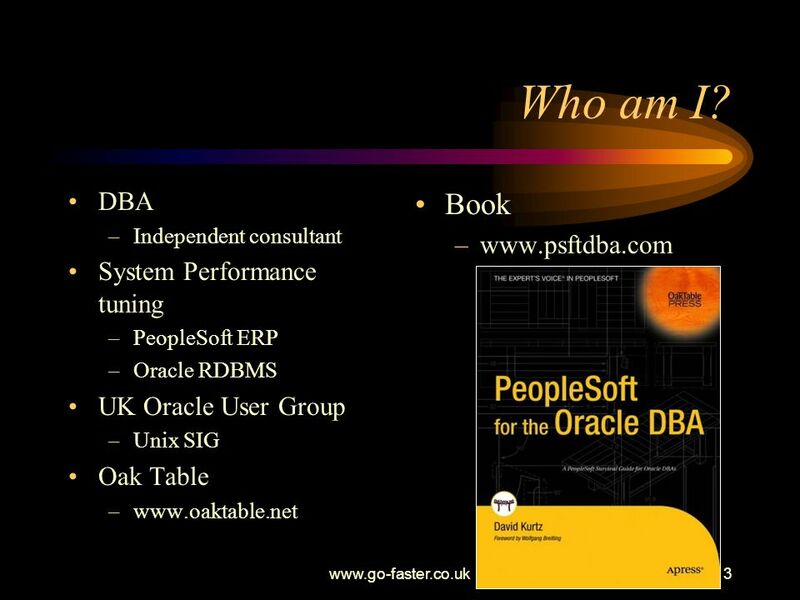 Independent consultant System Performance tuning PeopleSoft ERP Oracle RDBMS UK Oracle User Group Unix SIG Oak Table Book If who are into PeopleSoft I have written this book. For those of you who are not familiar with PeopleSoft. E-business suite is Oracle’s legacy ERP system and it will be replaced with PeopleSoft! 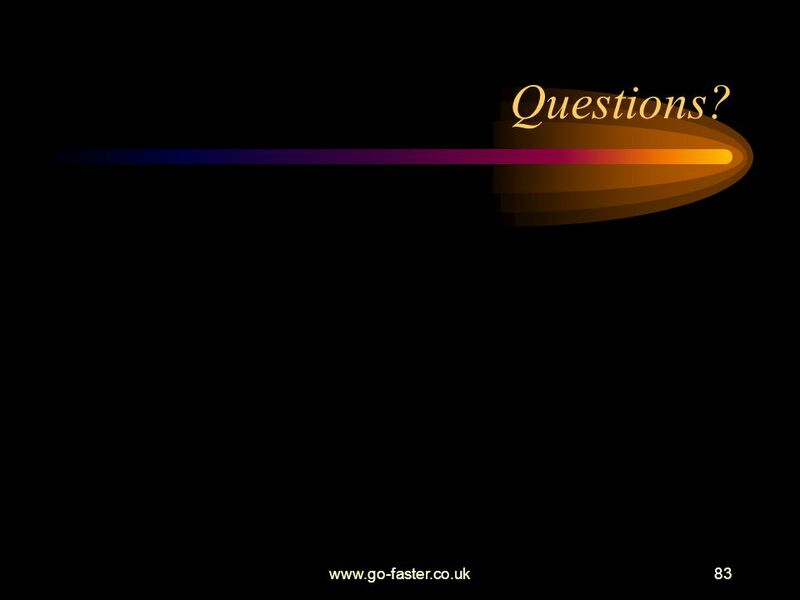 Go-Faster Consultancy Ltd.
Midlands What are you going to present? 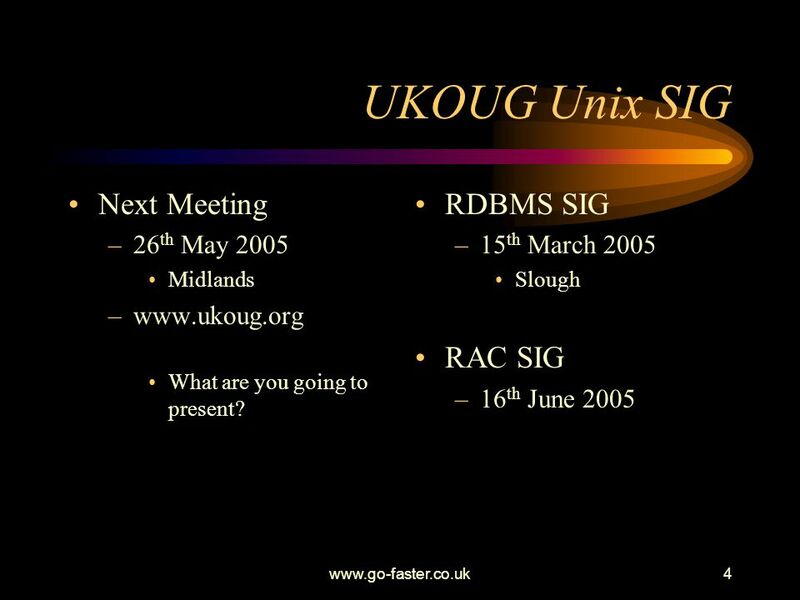 RDBMS SIG 15th March 2005 Slough RAC SIG 16th June 2005 Go-Faster Consultancy Ltd.
How to use these to solve performance problems. 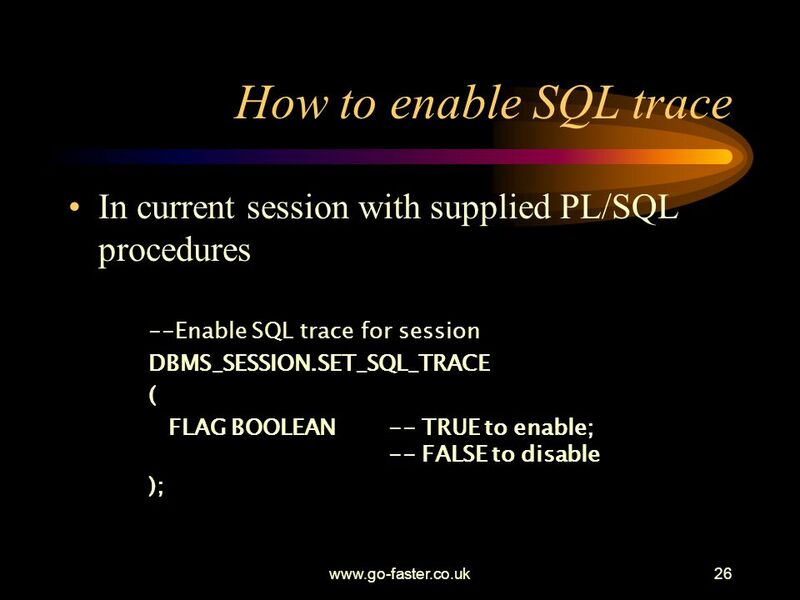 I want to talk about how to use SQL Trace, how to process the trace files, a bit on how to read execution plans. We will also talk about the timing information that you can get. But before we get into all that stuff I want to talk about why you should bother with any of that. 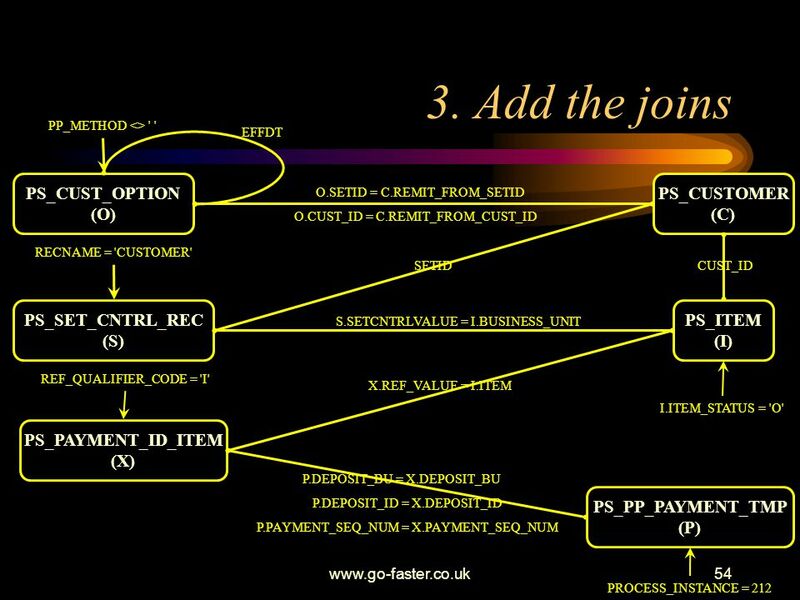 Go-Faster Consultancy Ltd. 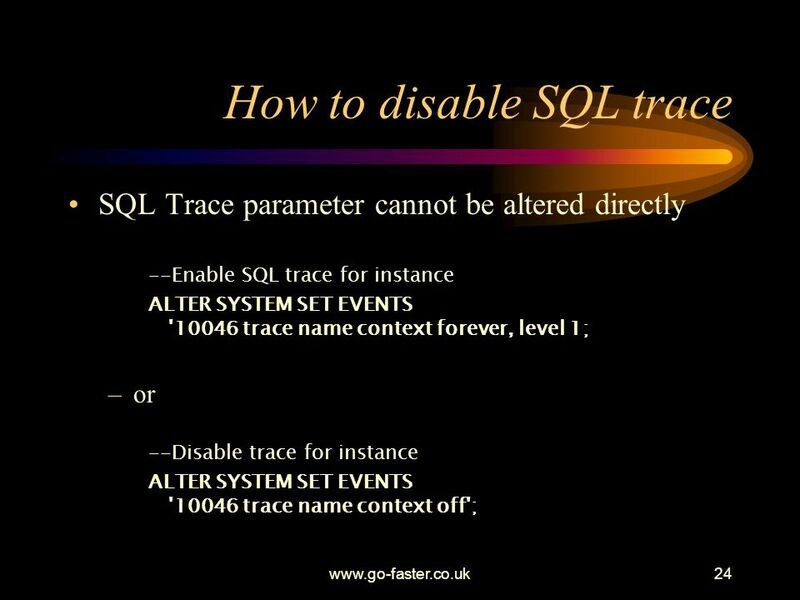 Trace can will locate a database problem It will prove that a problems IS NOT a database problem. 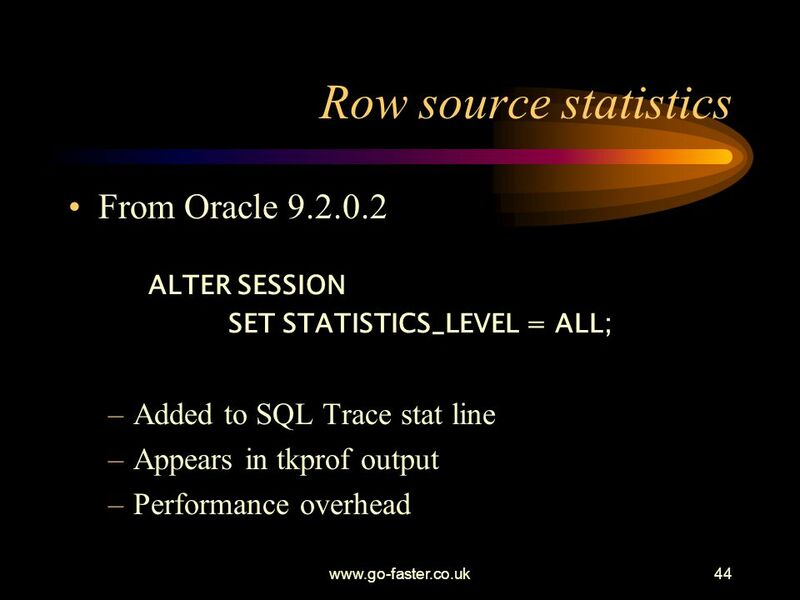 The user phoes support to say that the system is slow Support immedaiately phones the DBA to say that the system is slow so it must be the database Trace will tell you where the database is slow But it will also prove conclusively how much of the response time is not down to the database. With the ever increasing number of tiers in front of the database, there is more and more stuff to be done which is not the database. 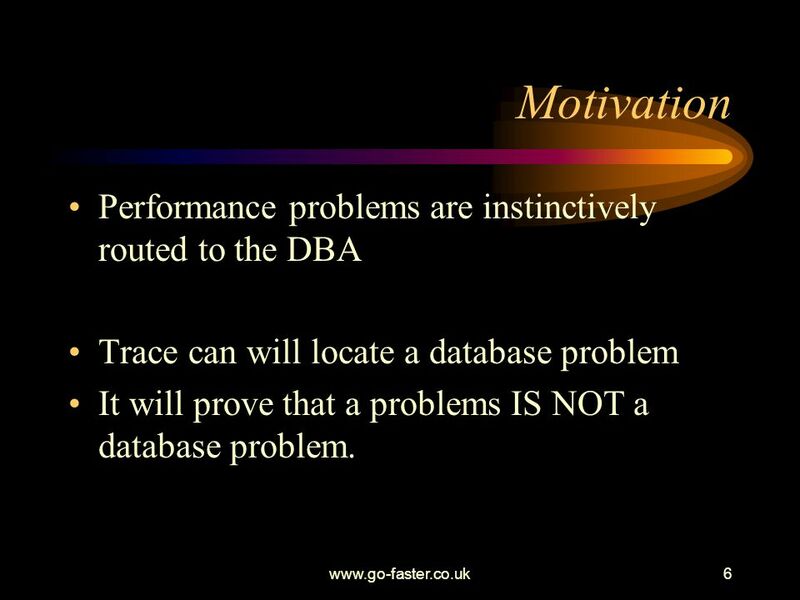 In many systems non-database problems fall to the DBA because the DBA is the most technically competant person to deal with them. Application server configuration, and sometiems also web configuration OS and disk subsystem. 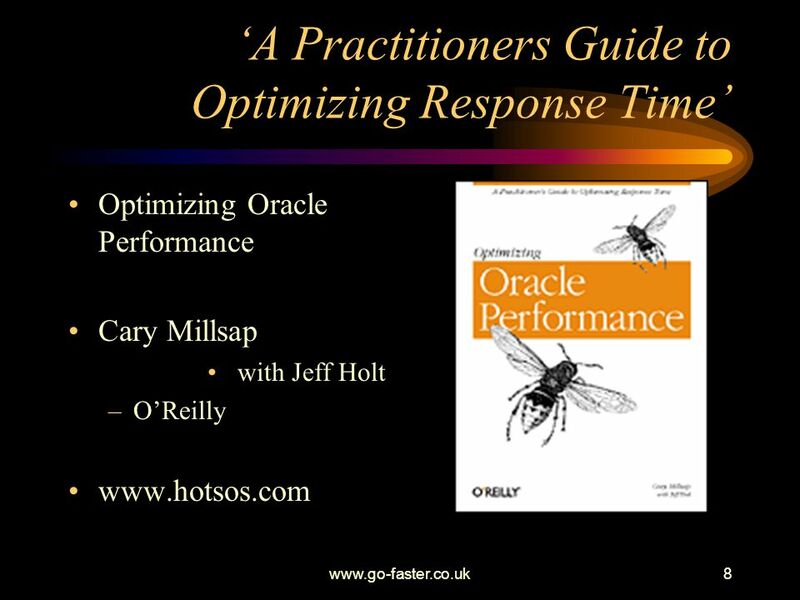 Go-Faster Consultancy Ltd.
R = response time S = service time W = wait time Yet Another Performance Profiling Method Anjo Kolk Shari Yamaguchi Jim Viscusi Yet Another Performance Profile Method Go-Faster Consultancy Ltd.
Optimizing Oracle Performance Cary Millsap with Jeff Holt O’Reilly This book is basically a manual of what I do. Read this and you can do it too. 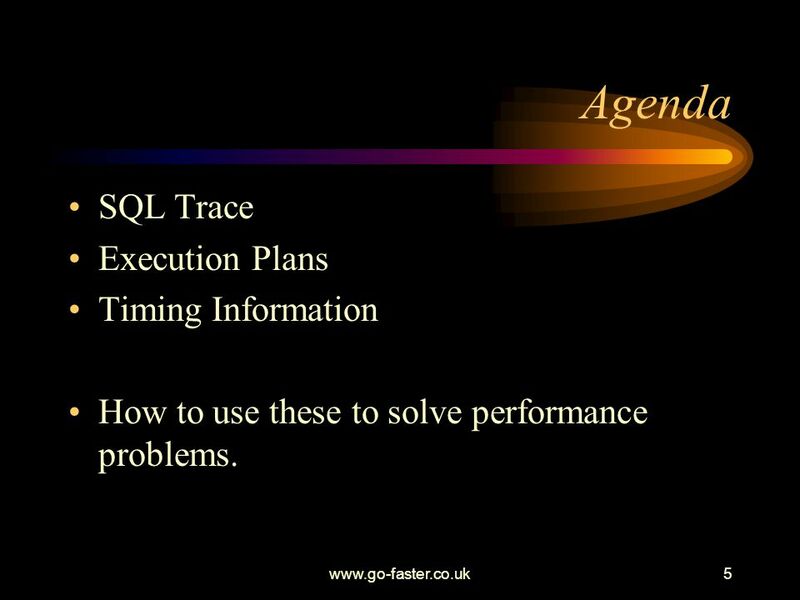 It discusses how to approach performance problems, and Oracle performance problems in particular. 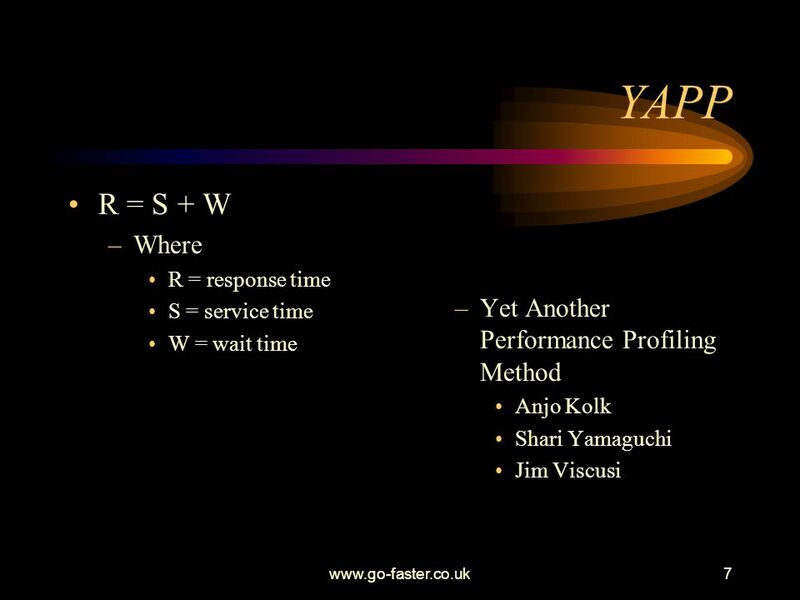 Go-Faster Consultancy Ltd. 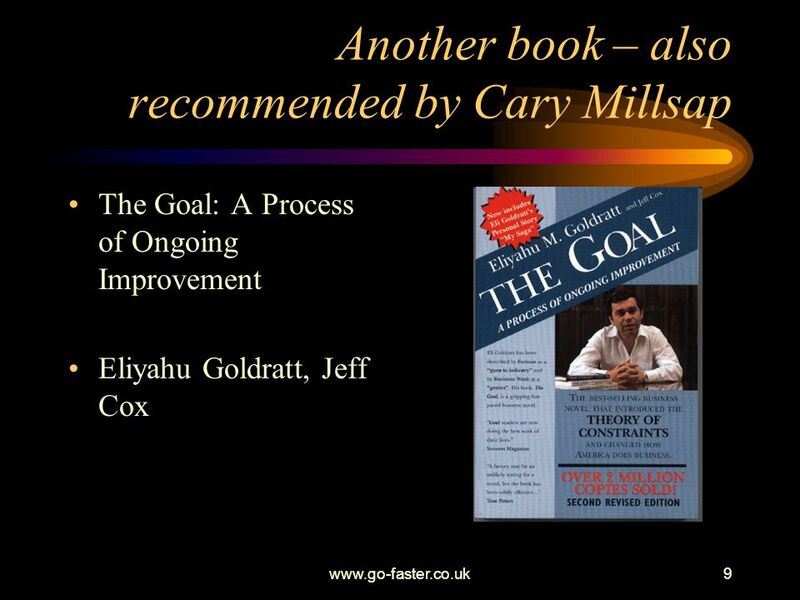 The Goal: A Process of Ongoing Improvement Eliyahu Goldratt, Jeff Cox This is a ‘novel’ about a man who runs a manufacturing plant somewhere in the US. It describes how he thinks he is running an efficient factory because all the efficiency measures on the individual parts of the factory indicate that all the parts are as efficient as possible, and so so the whole thing must be efficient. Except the factory is losing money and is threatened with closure. He meets his only physics teacher in an airport, who has become an tuning expert, and he It talks about wait times, and queuing and bottlenecks and things. 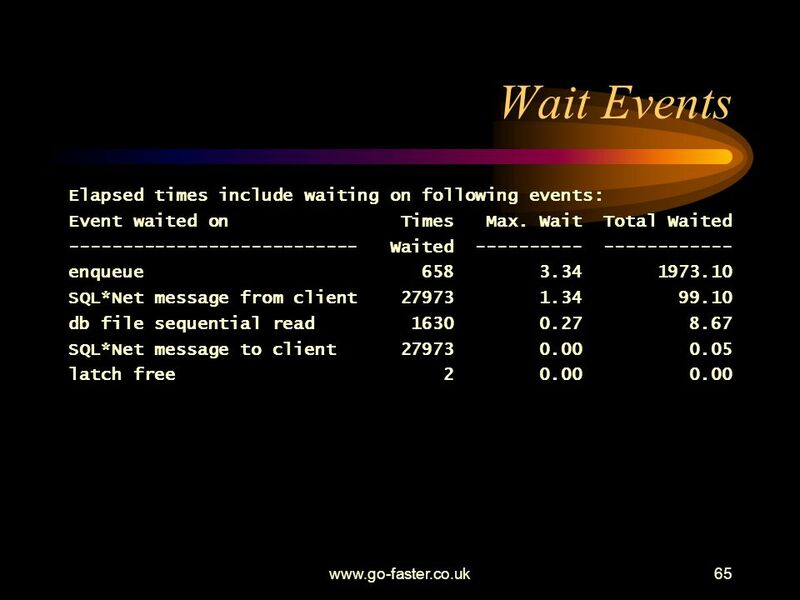 In fact a lot of the language sounds like the language we use when we discuss performance problems and wait interfaces and things. I coudn’t put it down – I read nearly all of it in one go. What was the goal of this manufacturing plant: The Goal is to make money by increasing net profit while simultaneously increasing return on investment and simultaneously increasing cash flow. What does this mean to you and me as IT professions. 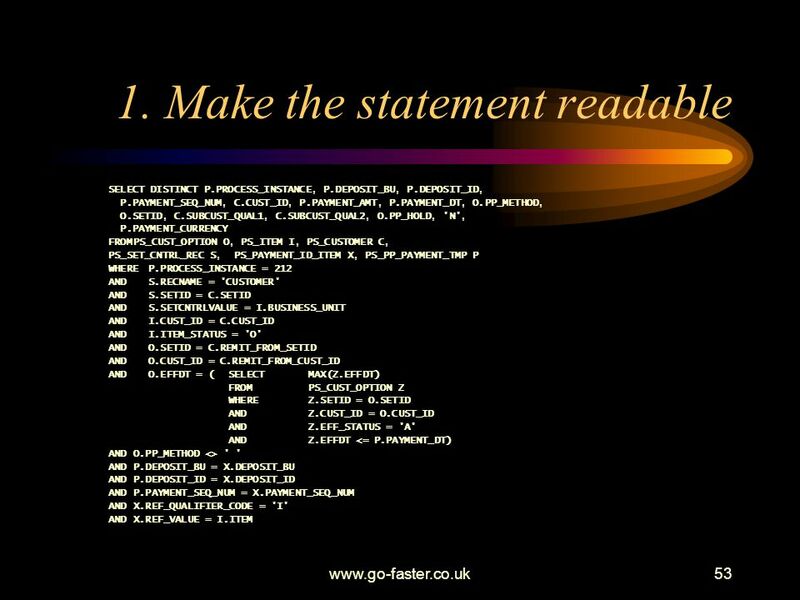 It means we have the test to help us decide what is important, and what isn’t Go-Faster Consultancy Ltd.
10 Aphorism Performance is exactly what the user perceives it to be. No more, no less. 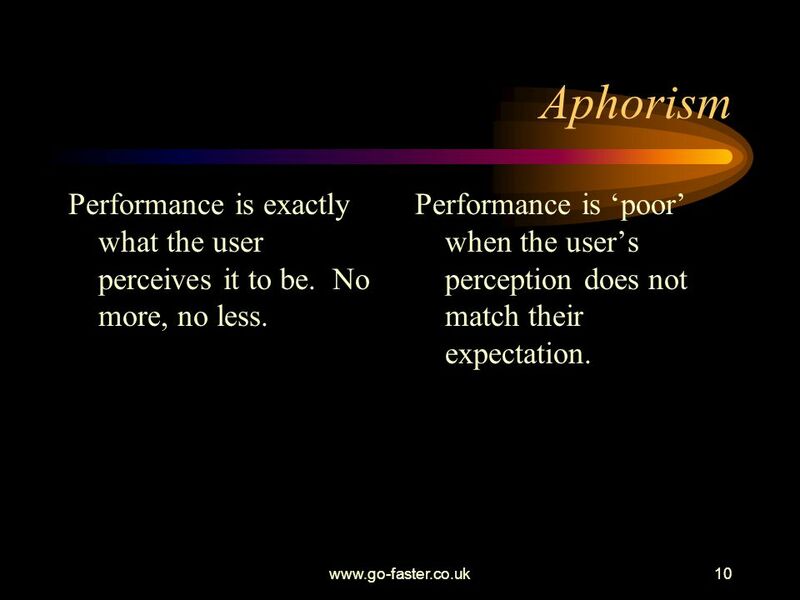 Performance is ‘poor’ when the user’s perception does not match their expectation. You really must measure what the user observes. Otherwise you are not measuring everything, and you may miss something, and that something might be the biggest cause of poor performance! 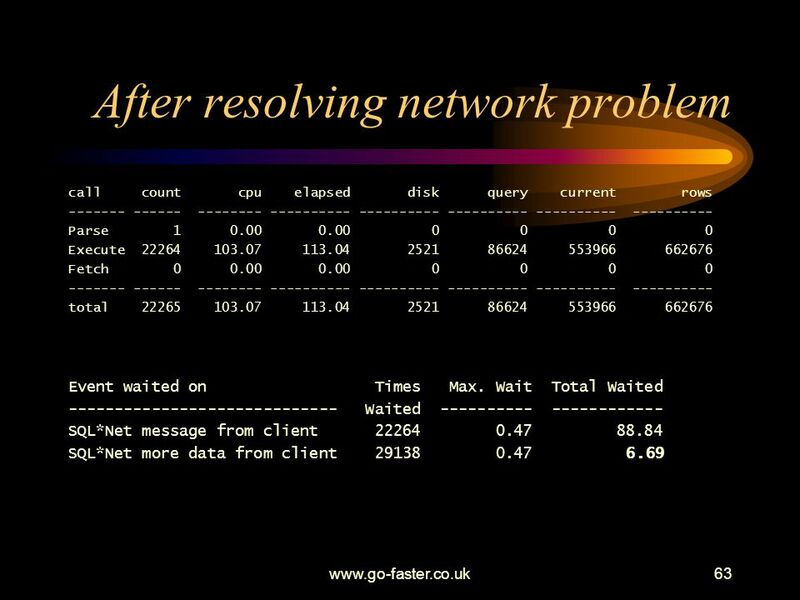 And your users are some of the best placed people to tell you what the problems are Go-Faster Consultancy Ltd. 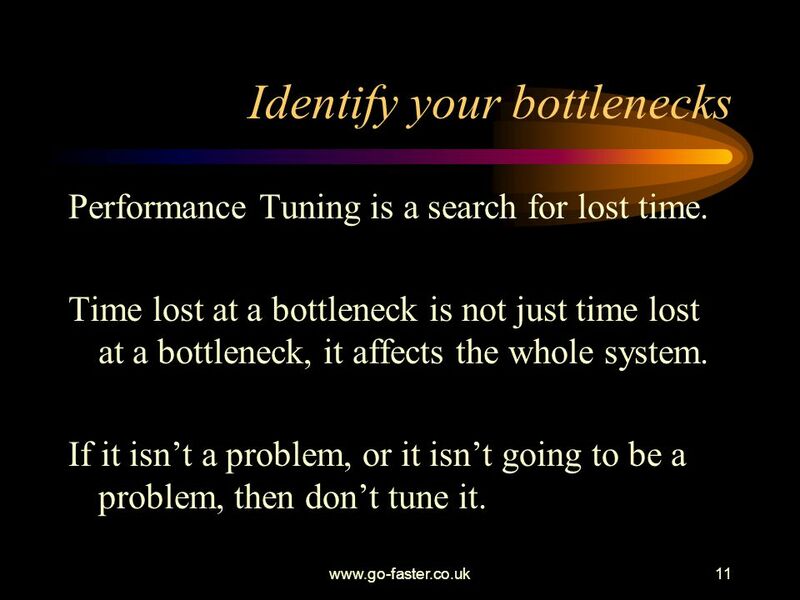 Performance Tuning is a search for lost time. Time lost at a bottleneck is not just time lost at a bottleneck, it affects the whole system. If it isn’t a problem, or it isn’t going to be a problem, then don’t tune it. The Goal is to make money by increasing net profit while simultaneously increasing return on investment and simultaneously increasing cash flow. The mantra of ‘The Goal’ is to identify your bottlenecks So before you enable trace, or pick up tkprof decide what needs to be tuned and what doesn’t. If a 5 batch runs in a 6 hour batch window then it isn’t a problem. If it is growing at half and hour per month, then it will be a problem and you will have to address it sometime. Go-Faster Consultancy Ltd.
Oracle shadow process writes to a text file in user_dump_dest. 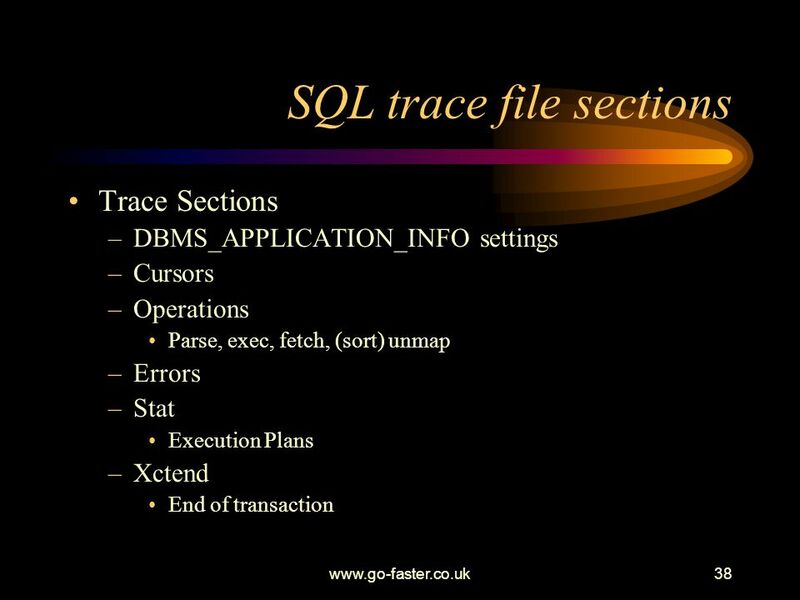 Trace file contains User and recursive SQL statements Execution plan, physical & logical reads Timing information Wait and bind information (optional) So you have a bottleneck, what will SQL Tracing it give you. Go-Faster Consultancy Ltd.
13 What is SQL trace? 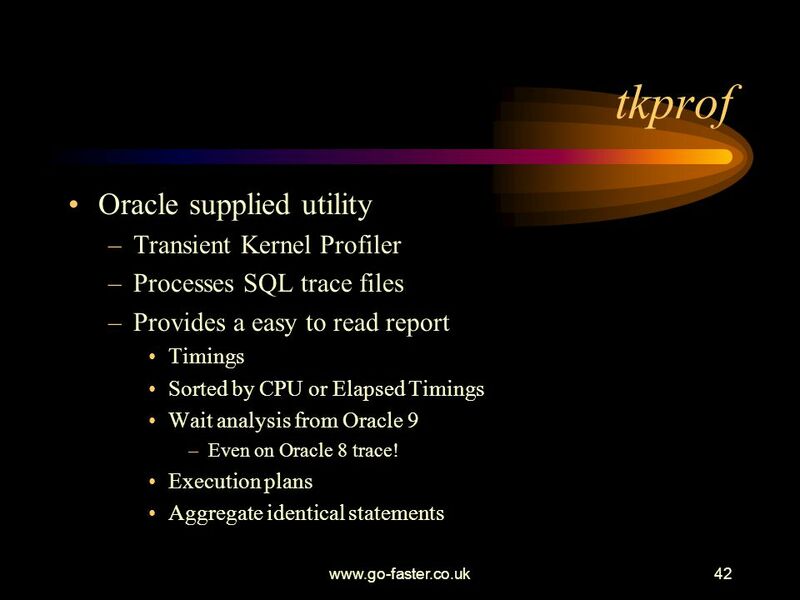 First appeared in Oracle 6. More instrumentation added at each release. Not friendly format, can be read by humans. 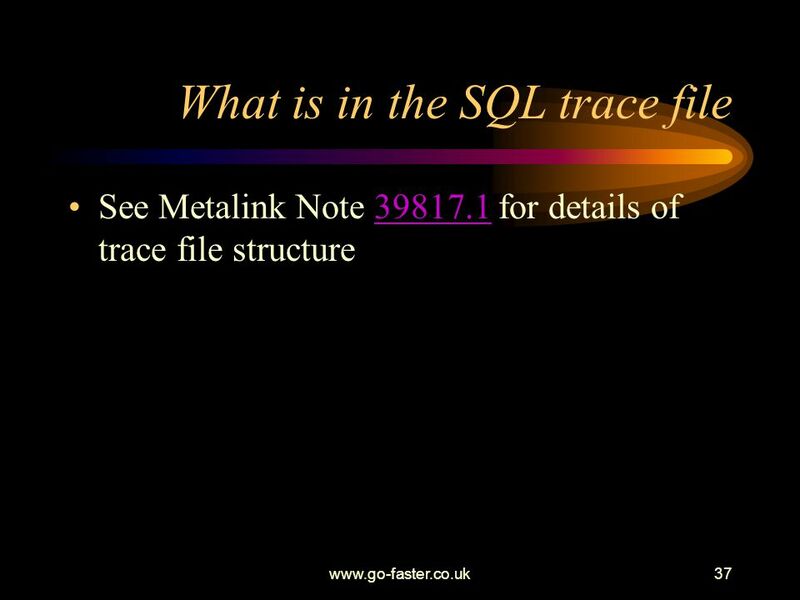 And sometimes that is necessary Metalink note details structure of trace files Usually process it with tkprof Go-Faster Consultancy Ltd.
14 So what should I trace? 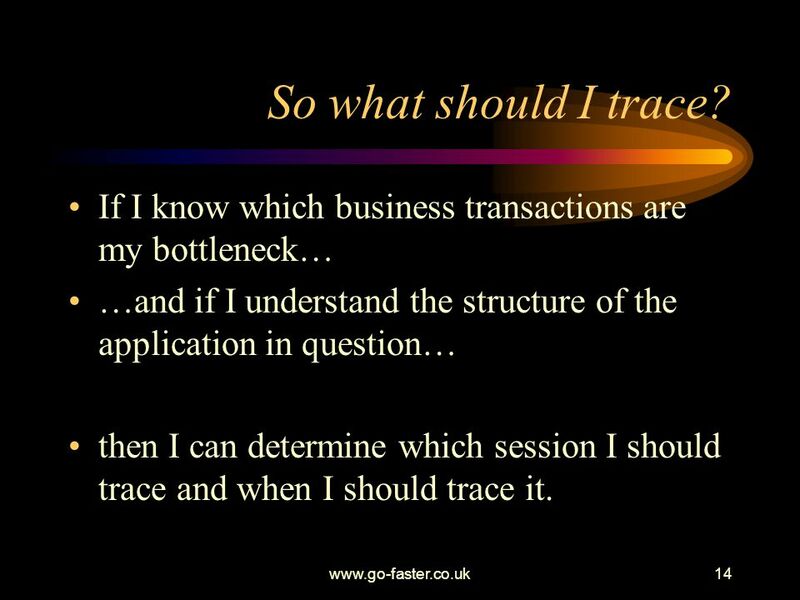 If I know which business transactions are my bottleneck… …and if I understand the structure of the application in question… then I can determine which session I should trace and when I should trace it. It can get more complex than that. When an application server is involved you may have to trace particular application server processes. 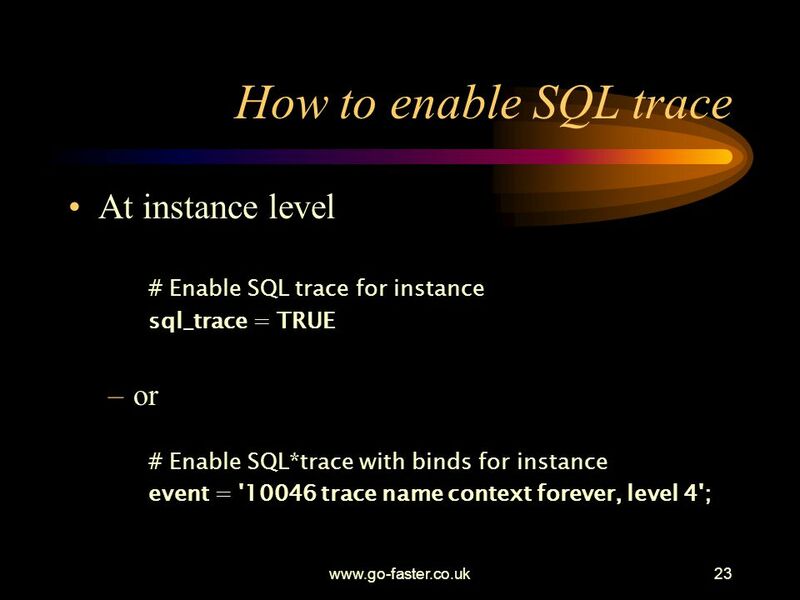 Sometimes I create a small application server just for me to test the transaction and I configure it with a single application server process and enable trace on that process’s session. It depends on the specific technology that you are working with. 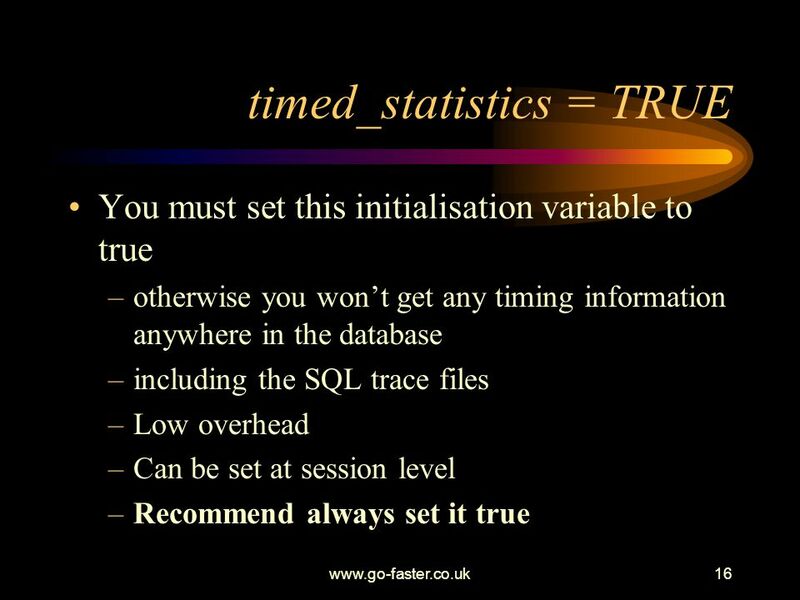 Go-Faster Consultancy Ltd.
timed_statistics = TRUE user_dump_dest = '<directory name>' max_dump_file_size = <size> _trace_files_public = TRUE trace_file_identifier = '<string>' Go-Faster Consultancy Ltd.
You must set this initialisation variable to true otherwise you won’t get any timing information anywhere in the database including the SQL trace files Low overhead Can be set at session level Recommend always set it true Go-Faster Consultancy Ltd.
17 max_dump_file_size Be careful that your trace files are not truncated. look at tail for message DUMP FILE SIZE IS LIMITED Your file may be truncated prior to the point of interest. Parameter expressed in O/S blocks, Kb, or Mb Dynamic parameter from Oracle 9.x h Go-Faster Consultancy Ltd. 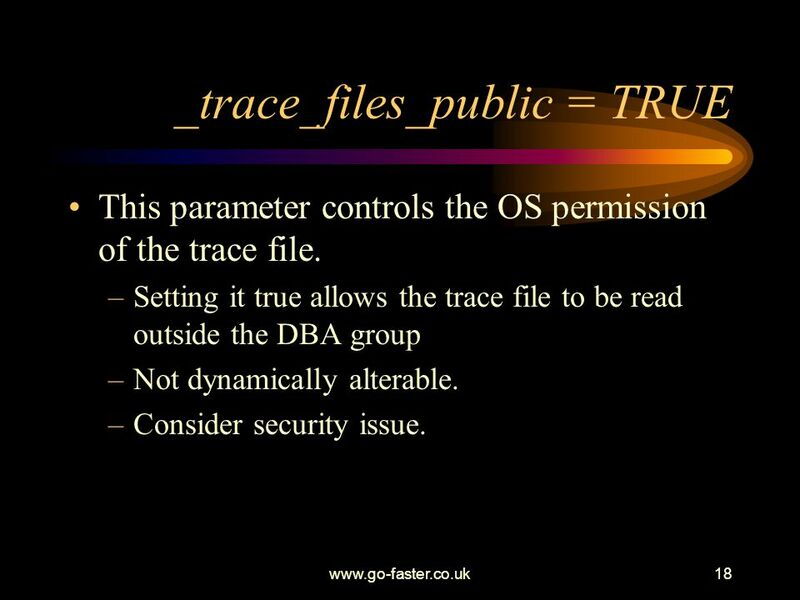 This parameter controls the OS permission of the trace file. 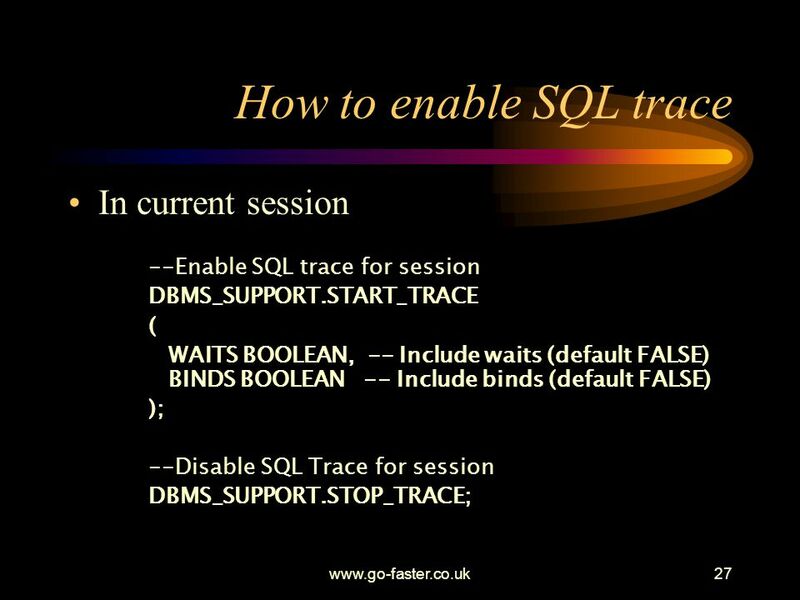 Setting it true allows the trace file to be read outside the DBA group Not dynamically alterable. Consider security issue. 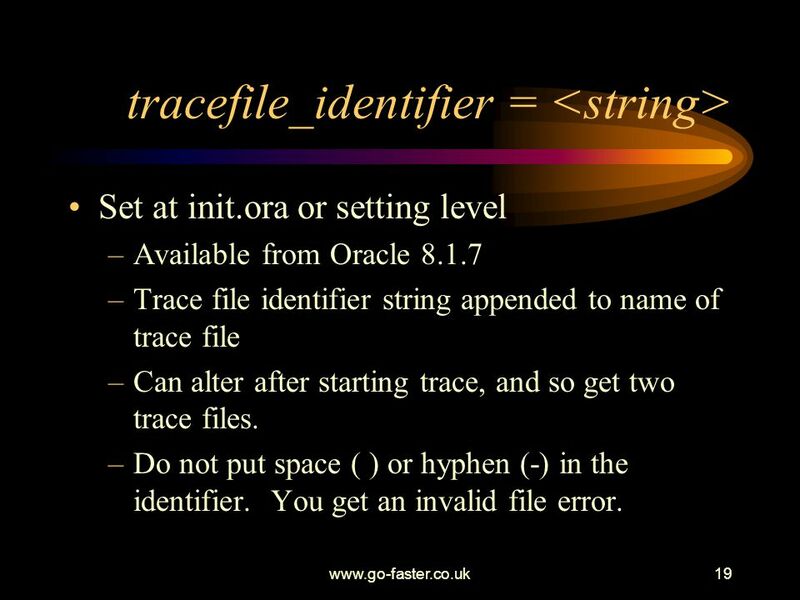 Go-Faster Consultancy Ltd.
Set at init.ora or setting level Available from Oracle 8.1.7 Trace file identifier string appended to name of trace file Can alter after starting trace, and so get two trace files. Do not put space ( ) or hyphen (-) in the identifier. You get an invalid file error. 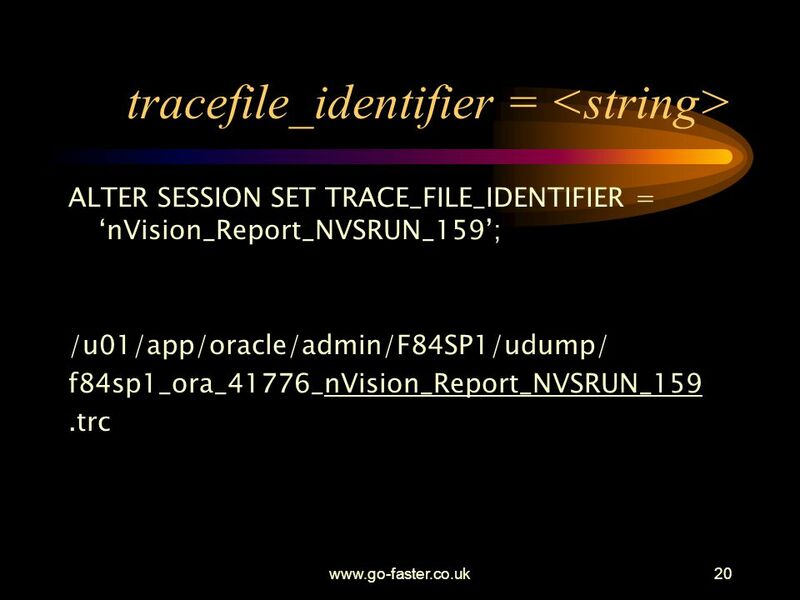 Go-Faster Consultancy Ltd.
ALTER SESSION SET TRACE_FILE_IDENTIFIER = ‘nVision_Report_NVSRUN_159’; /u01/app/oracle/admin/F84SP1/udump/ f84sp1_ora_41776_nVision_Report_NVSRUN_159 .trc So now I can see immediately from the trace file what the trace relates to. 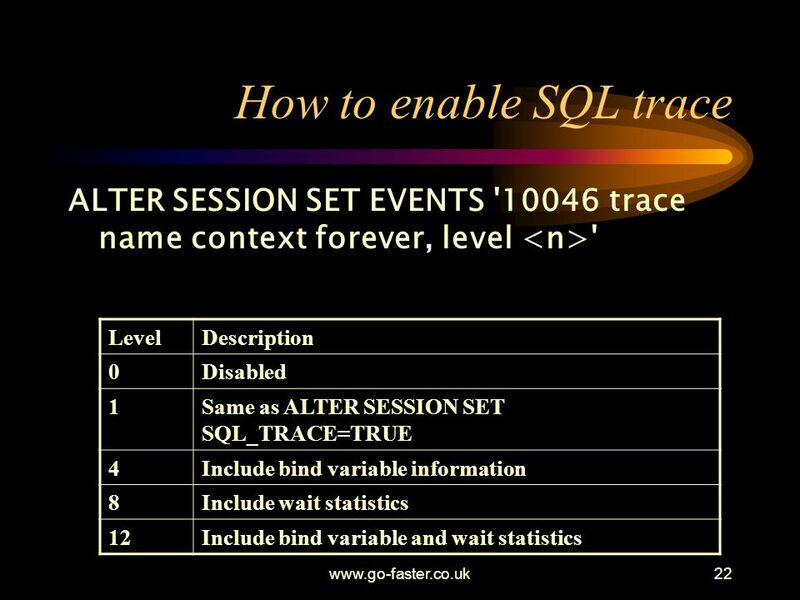 Go-Faster Consultancy Ltd.
Julian Dyke 10 methods of enabling trace information in Oracle Go-Faster Consultancy Ltd.
22 How to enable SQL trace ALTER SESSION SET EVENTS '10046 trace name context forever, level <n>' Level Description Disabled 1 Same as ALTER SESSION SET SQL_TRACE=TRUE 4 Include bind variable information 8 Include wait statistics 12 Include bind variable and wait statistics Go-Faster Consultancy Ltd.
DBMS_SYSTEM.SET_SQL_TRACE_IN_SESSION ( SI NUMBER, SID SE NUMBER, Serial Number SQL_TRACE BOOLEAN -- TRUE to enable; FALSE to disable ); SID and SERIAL# from V$SESSION. Trigger fired by starting process. 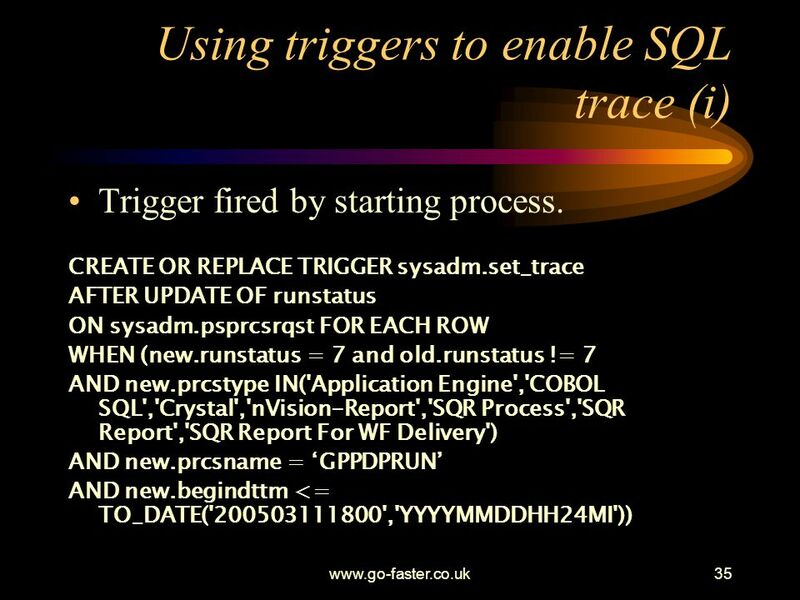 CREATE OR REPLACE TRIGGER sysadm.set_trace AFTER UPDATE OF runstatus ON sysadm.psprcsrqst FOR EACH ROW WHEN (new.runstatus = 7 and old.runstatus != 7 AND new.prcstype IN('Application Engine','COBOL SQL','Crystal','nVision-Report','SQR Process','SQR Report','SQR Report For WF Delivery') AND new.prcsname = ‘GPPDPRUN’ AND new.begindttm <= TO_DATE(' ','YYYYMMDDHH24MI')) In PeopleSoft batch processes are scheduled by an agent. 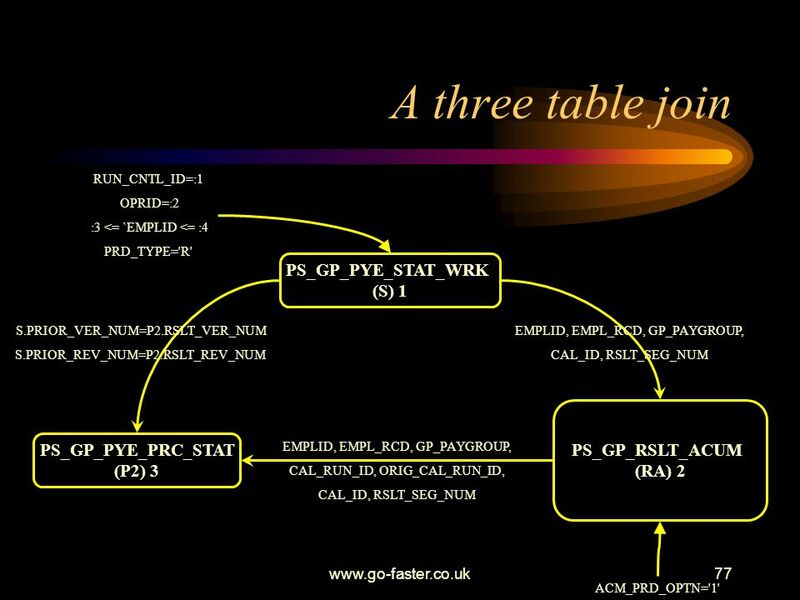 The who process is tied together with a control table psprcsrqst. When the process starts it updates its own status on that table to 7. The when clause can be adjusted to restrict when the trigger fires, for what processes, for what operators etc. Go-Faster Consultancy Ltd.
/u01/app/oracle/admin/F84SP1/udump/f84sp1_ora_41776_nVision_Report_NVSRUN_159.trc … Oracle9i Enterprise Edition Release bit Production JServer Release Production ORACLE_HOME = /u01/app/oracle/product/9.2.0 System name:	AIX Node name:	xxxxxxxxx Release:	3 Version:	4 Machine:	0000C6BF4C00 Instance name: F84SP1 Redo thread mounted by this instance: 1 Oracle process number: 28 Unix process pid: 41776, image: (TNS V1-V3) The head gives you information about the server version Go-Faster Consultancy Ltd. 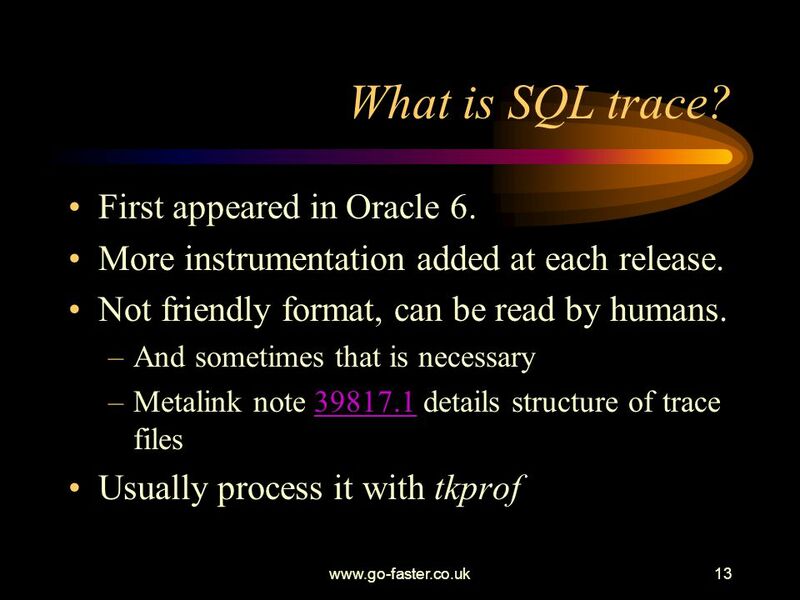 Processes SQL trace files Provides a easy to read report Timings Sorted by CPU or Elapsed Timings Wait analysis from Oracle 9 Even on Oracle 8 trace! Execution plans Aggregate identical statements If you enable 10046,8 on Oracle 8 you can process that trace file with a V9 tkprof and get the wait analysis. 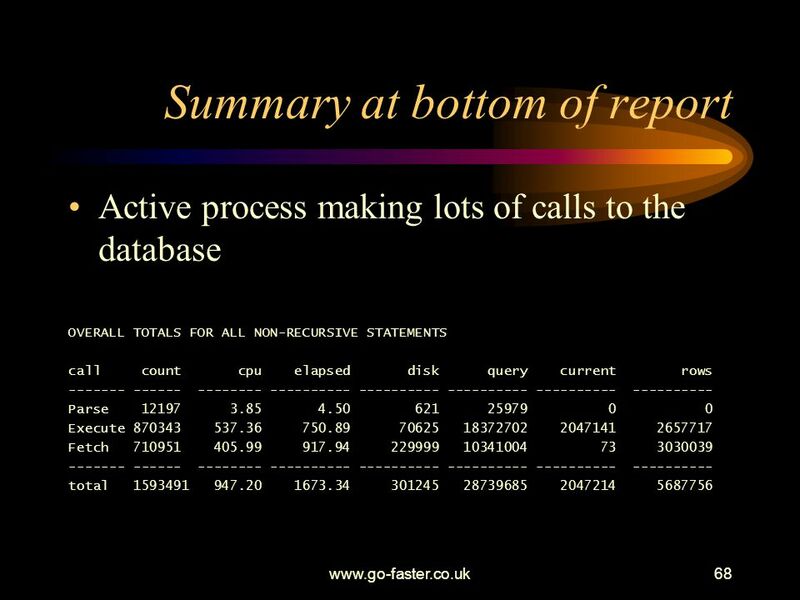 Go-Faster Consultancy Ltd.
And at the top of the report you have a big block of SQL. What do you do next? INSERT INTO PS_PP_CUST_TMP2 ( PROCESS_INSTANCE, DEPOSIT_BU, DEPOSIT_ID, PAYMENT_SEQ_NUM, CUST_ID, PAYMENT_AMT, PAYMENT_DT, PP_METHOD, SETID, SUBCUST_QUAL1, SUBCUST_QUAL2, PP_HOLD, PP_MET_SW, PAYMENT_CURRENCY ) SELECT DISTINCT P.PROCESS_INSTANCE, P.DEPOSIT_BU, P.DEPOSIT_ID, P.PAYMENT_SEQ_NUM, C.CUST_ID, P.PAYMENT_AMT, P.PAYMENT_DT, O.PP_METHOD, O.SETID, C.SUBCUST_QUAL1, C.SUBCUST_QUAL2, O.PP_HOLD, 'N', P.PAYMENT_CURRENCY FROM PS_CUST_OPTION O, PS_ITEM I, PS_CUSTOMER C, PS_SET_CNTRL_REC S, PS_PAYMENT_ID_ITEM X, PS_PP_PAYMENT_TMP P WHERE P.PROCESS_INSTANCE = AND S.RECNAME = 'CUSTOMER' AND S.SETID = C.SETID AND S.SETCNTRLVALUE = I.BUSINESS_UNIT AND I.CUST_ID = C.CUST_ID AND I.ITEM_STATUS = 'O' AND O.SETID = C.REMIT_FROM_SETID AND O.CUST_ID = C.REMIT_FROM_CUST_ID AND O.EFFDT = ( SELECT MAX(Z.EFFDT) FROM PS_CUST_OPTION Z WHERE Z.SETID = O.SETID AND Z.CUST_ID = O.CUST_ID AND Z.EFF_STATUS = 'A' AND Z.EFFDT <= P.PAYMENT_DT ) AND O.PP_METHOD <> ' ' AND P.DEPOSIT_BU = X.DEPOSIT_BU AND P.DEPOSIT_ID = X.DEPOSIT_ID AND P.PAYMENT_SEQ_NUM = X.PAYMENT_SEQ_NUM AND X.REF_QUALIFIER_CODE = 'I' AND X.REF_VALUE = I.ITEM The SQL statement is listed in the TKPROF output. All formatting is lost. 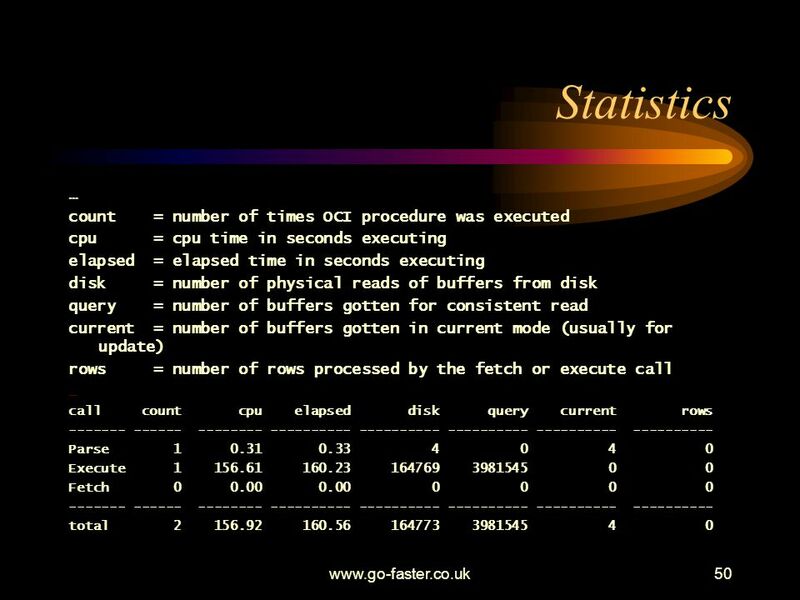 Go-Faster Consultancy Ltd.
cpu = cpu time in seconds executing elapsed = elapsed time in seconds executing disk = number of physical reads of buffers from disk query = number of buffers gotten for consistent read current = number of buffers gotten in current mode (usually for update) rows = number of rows processed by the fetch or execute call call count cpu elapsed disk query current rows Parse Execute Fetch total Then you get a set of timings for each statements Times are accurate to 1/100th of a second per execution Go-Faster Consultancy Ltd. 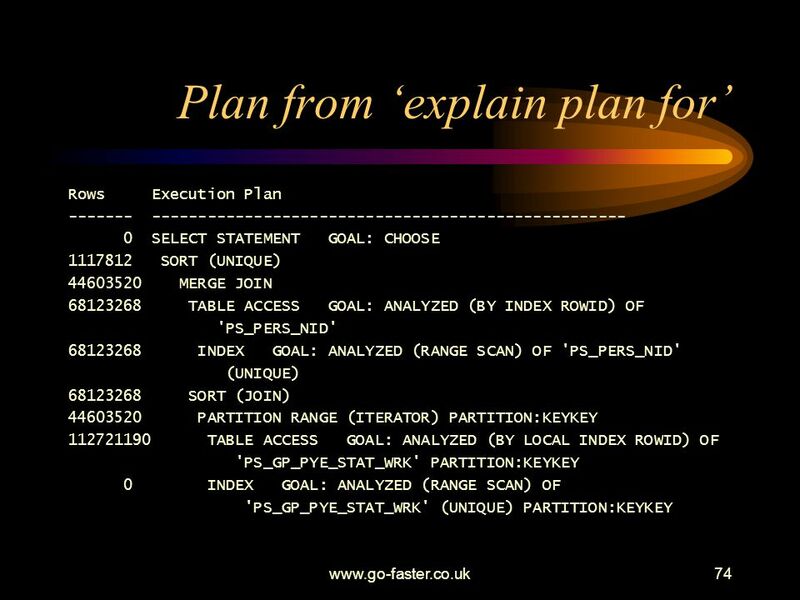 Rows Execution Plan 0 INSERT STATEMENT GOAL: CHOOSE 0 SORT (UNIQUE) 0 FILTER 0 NESTED LOOPS NESTED LOOPS NESTED LOOPS NESTED LOOPS NESTED LOOPS TABLE ACCESS BY INDEX ROWID PS_PP_PAYMENT_TMP INDEX (RANGE SCAN) (object id 9329) INDEX (RANGE SCAN) OF (object id 8105) TABLE ACCESS (BY INDEX ROWID) OF 'PS_SET_CNTRL_REC' INDEX (RANGE SCAN) OF (object id 12020) TABLE ACCESS (BY INDEX ROWID) OF 'PS_CUSTOMER' INDEX (RANGE SCAN) OF (object id 4751) INDEX (RANGE SCAN) OF 'PS#ITEM' (NON-UNIQUE) TABLE ACCESS (BY INDEX ROWID) OF 'PS_CUST_OPTION' INDEX (RANGE SCAN) OF (object id 4854) 0 SORT (AGGREGATE) TABLE ACCESS (BY INDEX ROWID) OF 'PS_CUST_OPTION' INDEX (RANGE SCAN) OF (object id 4854) From Oracle 8.1 you get this explain plan in the TKPROF output whether you connect TKPROF to the database or note. However, you do not get index names, only index object numbers. This is a version 8.1 trace because the index names are object Ids, from 9 you get index names in the stat lines. 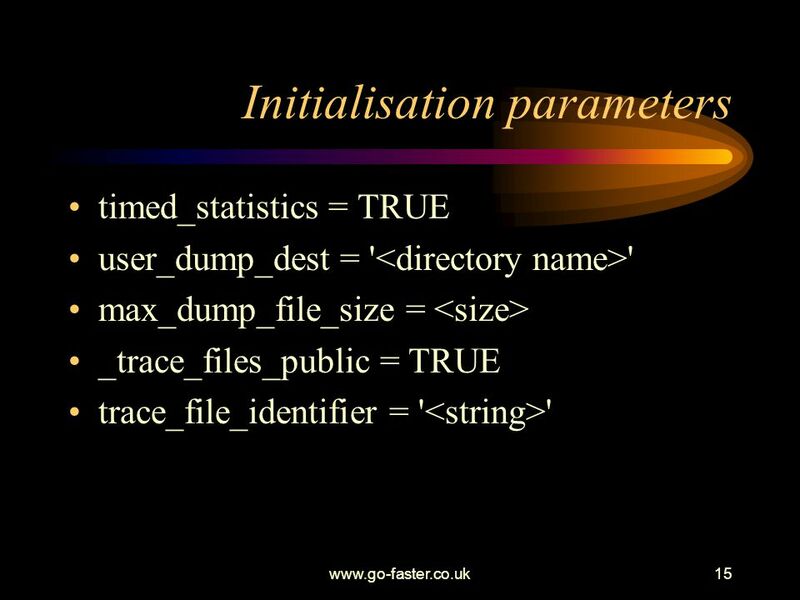 Go-Faster Consultancy Ltd. 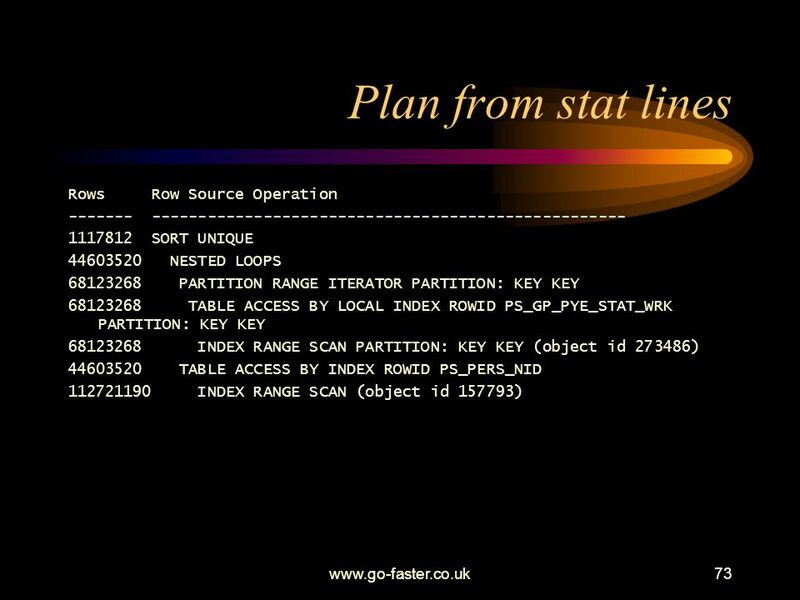 Rows Execution Plan 0 INSERT STATEMENT GOAL: CHOOSE 0 SORT (UNIQUE) 0 FILTER 0 NESTED LOOPS NESTED LOOPS NESTED LOOPS NESTED LOOPS NESTED LOOPS TABLE ACCESS (BY INDEX ROWID) OF 'PS_PP_PAYMENT_TMP' INDEX (RANGE SCAN) OF 'PSAPP_PAYMENT_TMP' (NON-UNIQUE) INDEX (RANGE SCAN) OF 'PSAPAYMENT_ID_ITEM' TABLE ACCESS (BY INDEX ROWID) OF 'PS_SET_CNTRL_REC' INDEX (RANGE SCAN) OF 'PSBSET_CNTRL_REC' TABLE ACCESS (BY INDEX ROWID) OF 'PS_CUSTOMER' INDEX (RANGE SCAN) OF 'PS#CUSTOMER' (NON-UNIQUE) INDEX (RANGE SCAN) OF 'PS#ITEM' (NON-UNIQUE) TABLE ACCESS (BY INDEX ROWID) OF 'PS_CUST_OPTION' INDEX (RANGE SCAN) OF 'PS_CUST_OPTION' (UNIQUE) 0 SORT (AGGREGATE) TABLE ACCESS (BY INDEX ROWID) OF 'PS_CUST_OPTION' INDEX (RANGE SCAN) OF 'PS_CUST_OPTION' (UNIQUE) In any version of Oracle & TKPROF, if you connect to the database you get this version of the explain plan. The object numbers have been resolved to index names. In this particular case, it is quite clear from the sudden jump in the size of the numbers that that the PS_CUSTOMER table is being read inefficently. 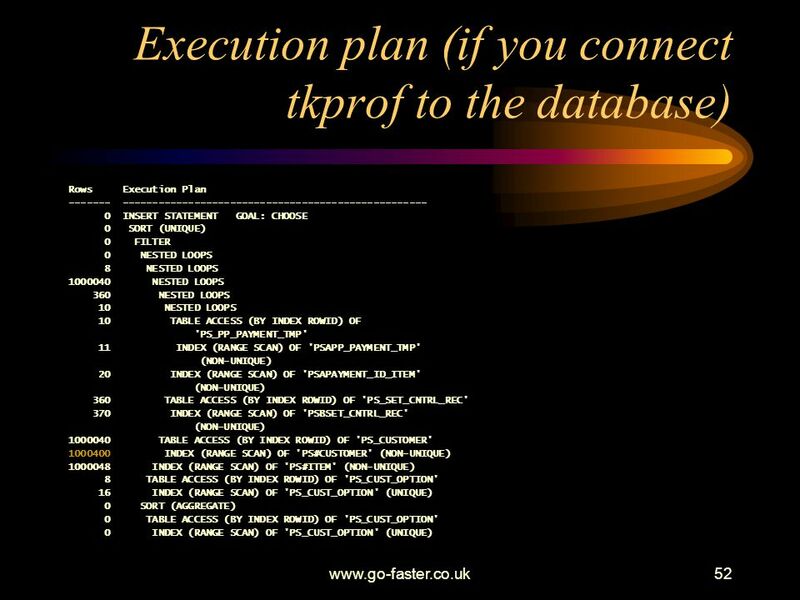 In order to found out why this is happening it is necessary to read the execution plan. 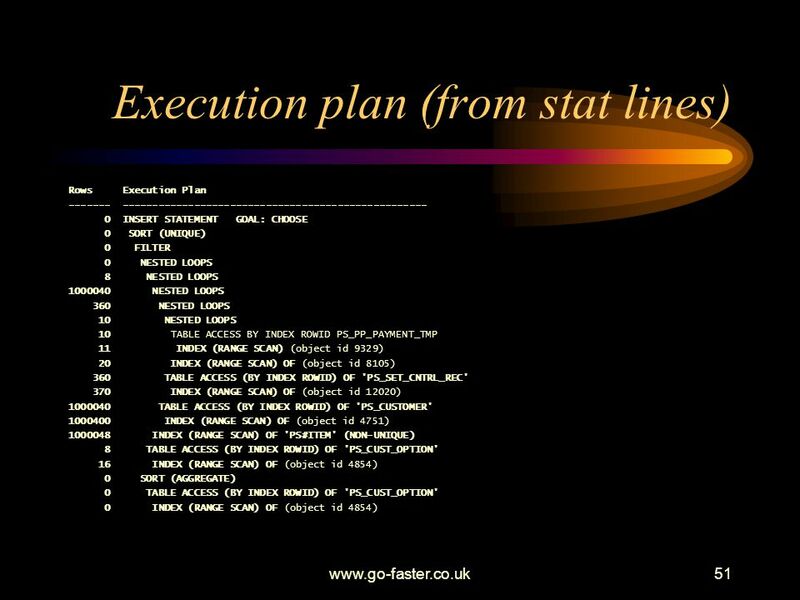 It is important to view the execution plan in a non-proportional font. Start at the top of the execution plan and read down to the line before the first un-indent. A range scan of 11 rows from index PSAPP_PAYMENT_TMP is used to read 10 rows from table PS_PP_PAYMENT_TMP. 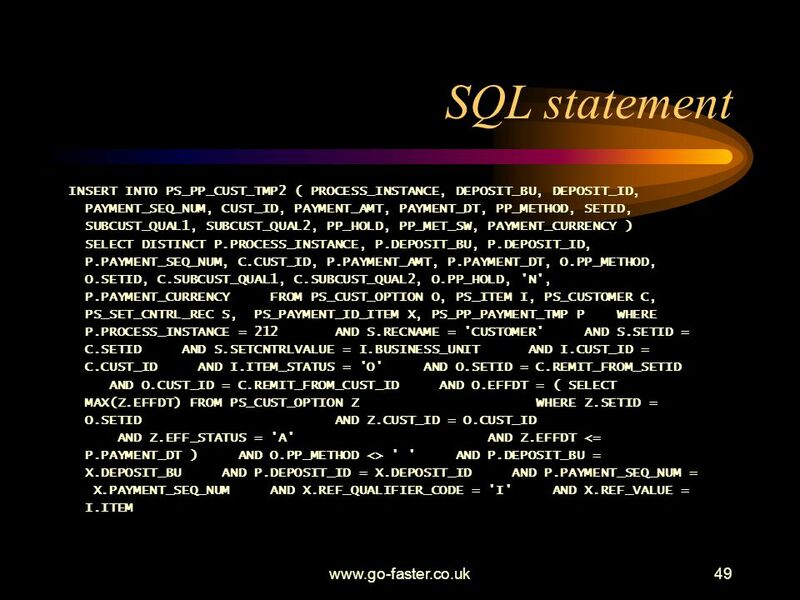 .That is used to drive a nested loop join to table PS_PAYMENT_ID_ITEM, but all the data can in fact be derived from the index PSAPAYMENT_ID_ITEM. 20 rows are read from the index, but the product remains at 10 rows. 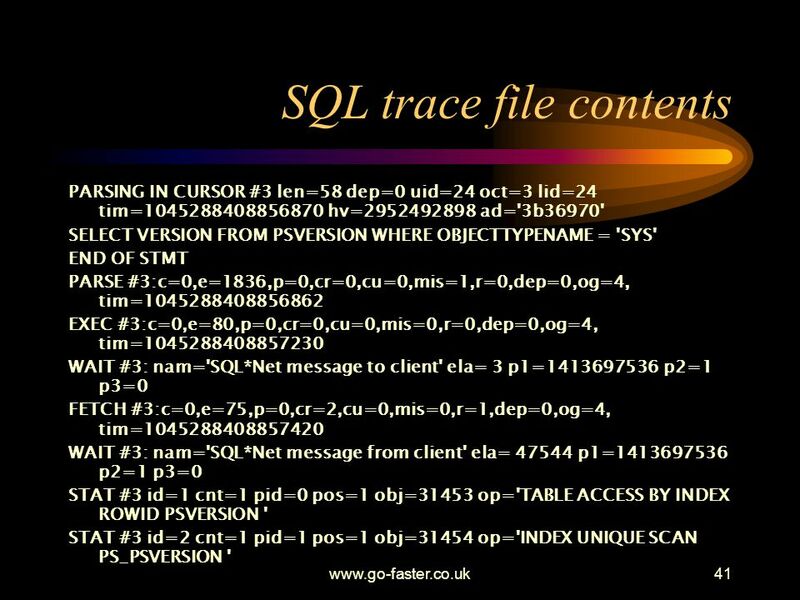 .That result is then joined to the table PS_SET_CNTRL_REC. 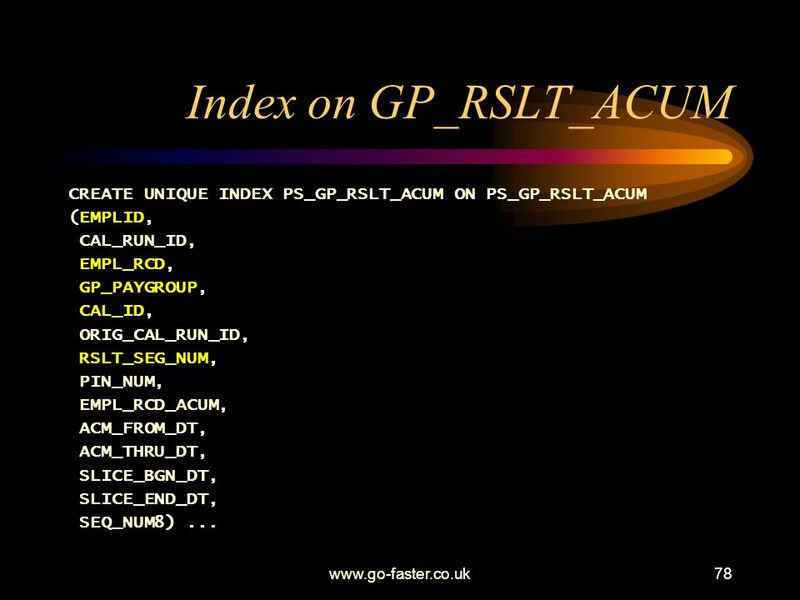 It is searched by index PSBSET_CNTRL_REC rows are read from the index to retrieve 360 rows from the table. The product grows to 360 rows. 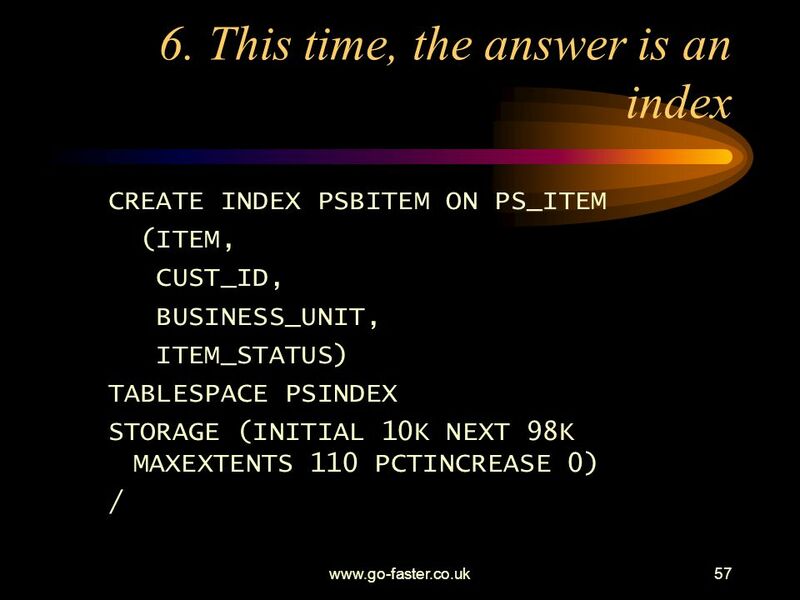 Next, table PS_CUSTOMER is join to the product, it is searched by index PS#CUSTOMER rows are read from the index that retrieves rows from the table. The result set grows to rows The PS_ITEM table is joined on. All the data is satisfied from the PS#ITEM index rows are read in, but the result ends up with 8 rows. 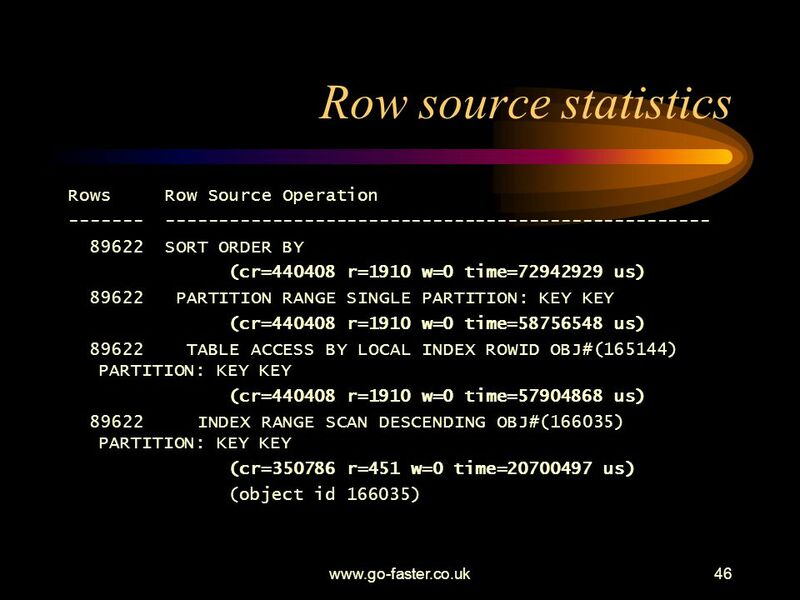 .16 rows are read from the unique index PS_CUST_OPTION to retrieve 8 rows from the table PS_CUST_OPTION. The result set is now empty. .The effective date sub-query would be executed on PS_CUST_OPTION if there were any rows in the result set. It would be searched by the index PS_CUST_OPTION. The result set is still empty. .The result set is then sorted because of the distinct at the front of the select clause. 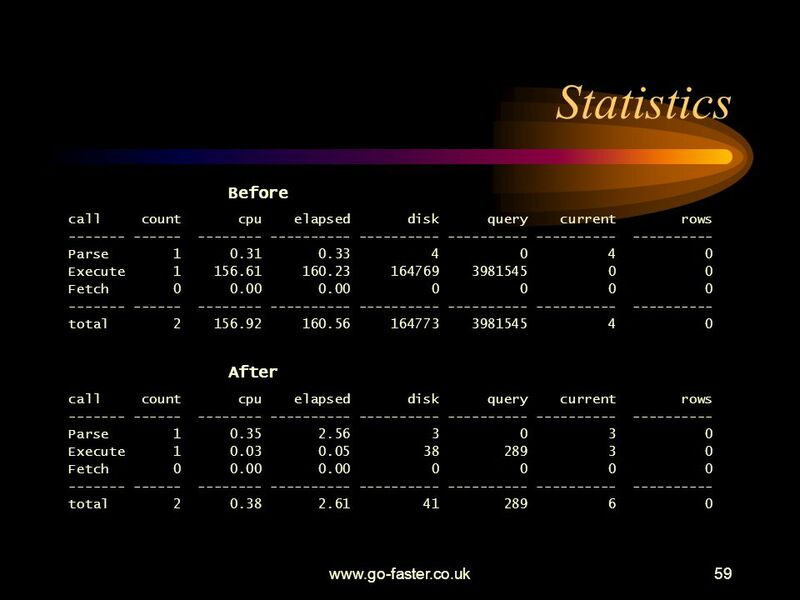 Go-Faster Consultancy Ltd. SELECT DISTINCT P.PROCESS_INSTANCE, P.DEPOSIT_BU, P.DEPOSIT_ID, P.PAYMENT_SEQ_NUM, C.CUST_ID, P.PAYMENT_AMT, P.PAYMENT_DT, O.PP_METHOD, O.SETID, C.SUBCUST_QUAL1, C.SUBCUST_QUAL2, O.PP_HOLD, 'N', P.PAYMENT_CURRENCY FROM	PS_CUST_OPTION O, PS_ITEM I, PS_CUSTOMER C, PS_SET_CNTRL_REC S, PS_PAYMENT_ID_ITEM X, PS_PP_PAYMENT_TMP P WHERE	P.PROCESS_INSTANCE = 212 AND S.RECNAME = 'CUSTOMER' AND S.SETID = C.SETID AND S.SETCNTRLVALUE = I.BUSINESS_UNIT AND I.CUST_ID = C.CUST_ID AND I.ITEM_STATUS = 'O' AND O.SETID = C.REMIT_FROM_SETID AND O.CUST_ID = C.REMIT_FROM_CUST_ID AND O.EFFDT = (	SELECT MAX(Z.EFFDT) FROM PS_CUST_OPTION Z WHERE Z.SETID = O.SETID AND Z.CUST_ID = O.CUST_ID AND Z.EFF_STATUS = 'A' AND Z.EFFDT <= P.PAYMENT_DT) AND O.PP_METHOD <> ' ' AND P.DEPOSIT_BU = X.DEPOSIT_BU AND P.DEPOSIT_ID = X.DEPOSIT_ID AND P.PAYMENT_SEQ_NUM = X.PAYMENT_SEQ_NUM AND X.REF_QUALIFIER_CODE = 'I' AND X.REF_VALUE = I.ITEM The next stage is to lay the statement out so that it is readable. No matter how the SQL was formatted when it went into the database, all that formatting will be lost by the time it comes out again in TKPROF The important thing is to concentrate on the query. The FROM and WHERE clauses are what really matters. 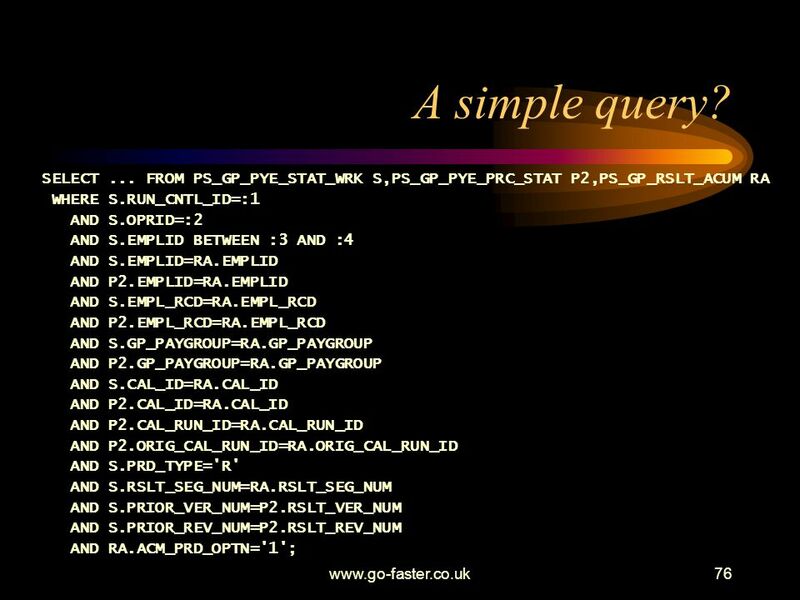 This way you can easily see what tables are in the query and what joins are involved. 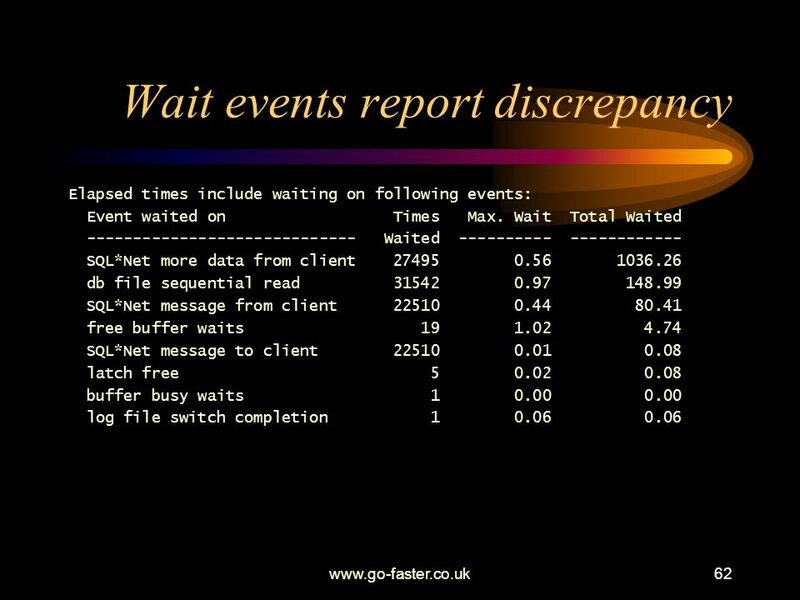 Go-Faster Consultancy Ltd.
PP_METHOD <> ' ' EFFDT PS_CUST_OPTION (O) PS_CUSTOMER (C) O.SETID = C.REMIT_FROM_SETID O.CUST_ID = C.REMIT_FROM_CUST_ID RECNAME = 'CUSTOMER' SETID CUST_ID PS_SET_CNTRL_REC (S) PS_ITEM (I) S.SETCNTRLVALUE = I.BUSINESS_UNIT REF_QUALIFIER_CODE = 'I' X.REF_VALUE = I.ITEM I.ITEM_STATUS = 'O' PS_PAYMENT_ID_ITEM (X) Although the SQL is now laid out in a easy to read format, it is still not clear what is going on. 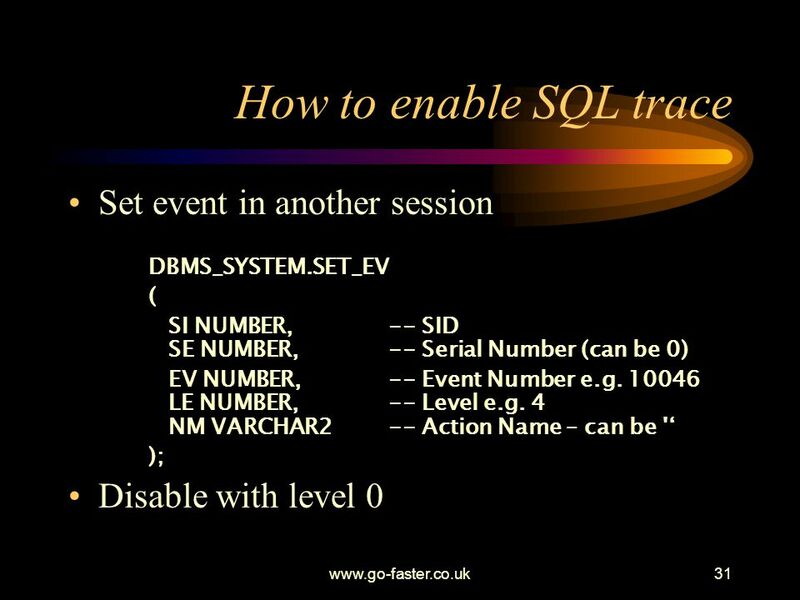 The following graphical technique may be used to illustrate the connections between tables made in the query. Start by simply putting the tables down. The order does not matter, but it helps if related tables are adjacent. This prevents a tangle of crossed lines later. 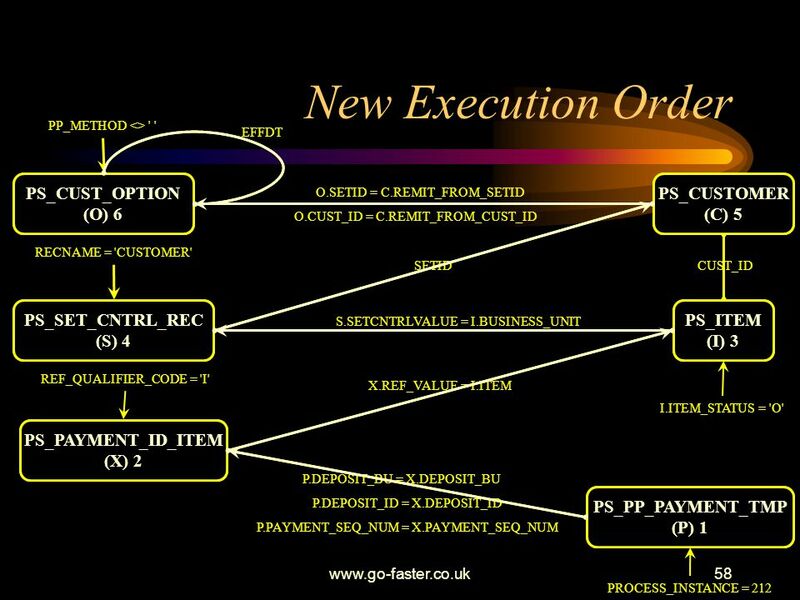 P.DEPOSIT_BU = X.DEPOSIT_BU P.DEPOSIT_ID = X.DEPOSIT_ID P.PAYMENT_SEQ_NUM = X.PAYMENT_SEQ_NUM PS_PP_PAYMENT_TMP (P) PROCESS_INSTANCE = 212 Go-Faster Consultancy Ltd.
0 FILTER 0 NESTED LOOPS NESTED LOOPS NESTED LOOPS NESTED LOOPS NESTED LOOPS (1)TABLE ACCESS (BY INDEX ROWID) OF 'PS_PP_PAYMENT_TMP' INDEX (RANGE SCAN) OF 'PSAPP_PAYMENT_TMP' (NON-UNIQUE) (2)INDEX (RANGE SCAN) OF 'PSAPAYMENT_ID_ITEM' (3)TABLE ACCESS (BY INDEX ROWID) OF 'PS_SET_CNTRL_REC' INDEX (RANGE SCAN) OF 'PSBSET_CNTRL_REC' (4)TABLE ACCESS (BY INDEX ROWID) OF 'PS_CUSTOMER' INDEX (RANGE SCAN) OF 'PS#CUSTOMER' (NON-UNIQUE) (5)INDEX (RANGE SCAN) OF 'PS#ITEM' (NON-UNIQUE) (6)TABLE ACCESS (BY INDEX ROWID) OF 'PS_CUST_OPTION' INDEX (RANGE SCAN) OF 'PS_CUST_OPTION' (UNIQUE) 0 SORT (AGGREGATE) TABLE ACCESS (BY INDEX ROWID) OF 'PS_CUST_OPTION' INDEX (RANGE SCAN) OF 'PS_CUST_OPTION' (UNIQUE) .The order in which the tables are processed within the query can be obtained from the explain plan. 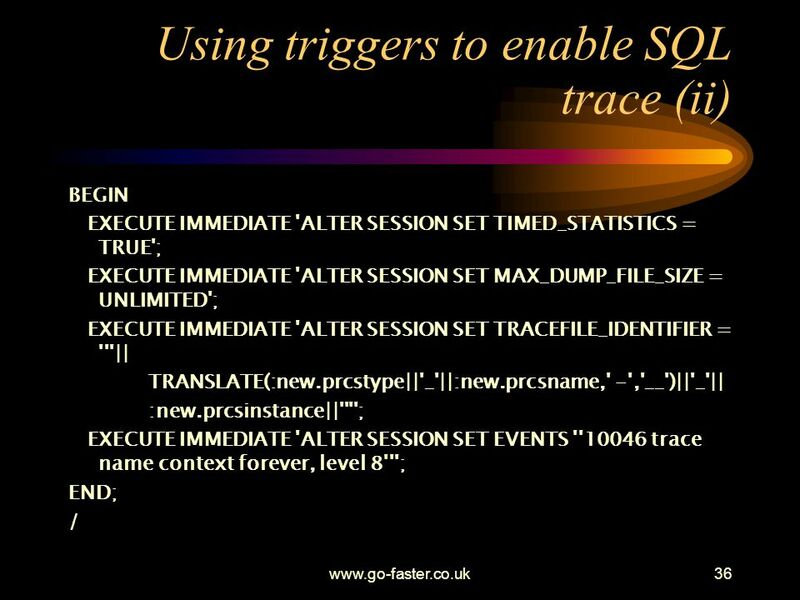 I have added the bracketed numbers Go-Faster Consultancy Ltd.
PP_METHOD <> ' ' EFFDT PS_CUST_OPTION (O) 6 PS_CUST_OPTION (O) PS_CUSTOMER (C) 4 PS_CUSTOMER (C) O.SETID = C.REMIT_FROM_SETID O.CUST_ID = C.REMIT_FROM_CUST_ID RECNAME = 'CUSTOMER' SETID CUST_ID PS_SET_CNTRL_REC (S) PS_SET_CNTRL_REC (S) 3 PS_ITEM (I) PS_ITEM (I) 5 S.SETCNTRLVALUE = I.BUSINESS_UNIT REF_QUALIFIER_CODE = 'I' X.REF_VALUE = I.ITEM I.ITEM_STATUS = 'O' PS_PAYMENT_ID_ITEM (X) PS_PAYMENT_ID_ITEM (X) 2 Although the SQL is now laid out in a easy to read format, it is still not clear what is going on. 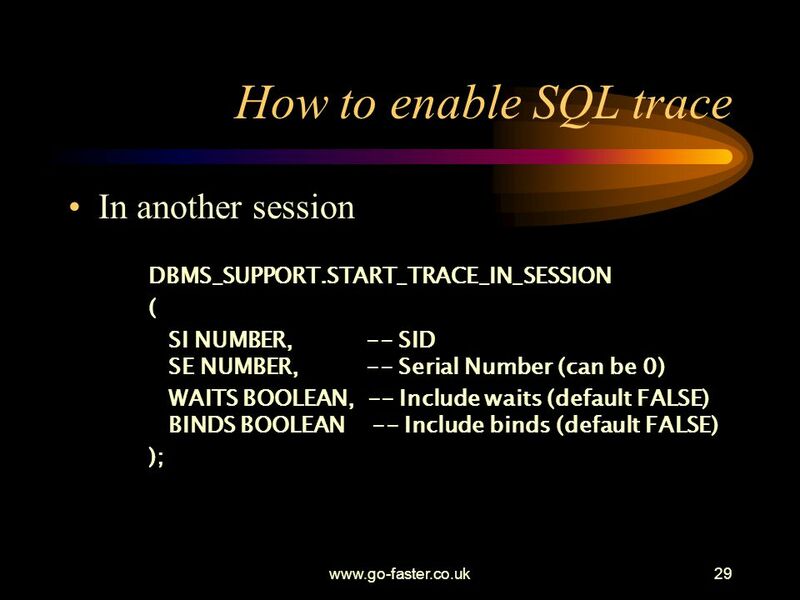 The following graphical technique may be used to illustrate the connections between tables made in the query. Start by simply putting the tables down. The order does not matter, but it helps if related tables are adjacent. This prevents a tangle of crossed lines later. P.DEPOSIT_BU = X.DEPOSIT_BU P.DEPOSIT_ID = X.DEPOSIT_ID P.PAYMENT_SEQ_NUM = X.PAYMENT_SEQ_NUM PS_PP_PAYMENT_TMP (P) PS_PP_PAYMENT_TMP (P) 1 PROCESS_INSTANCE = 212 Go-Faster Consultancy Ltd. 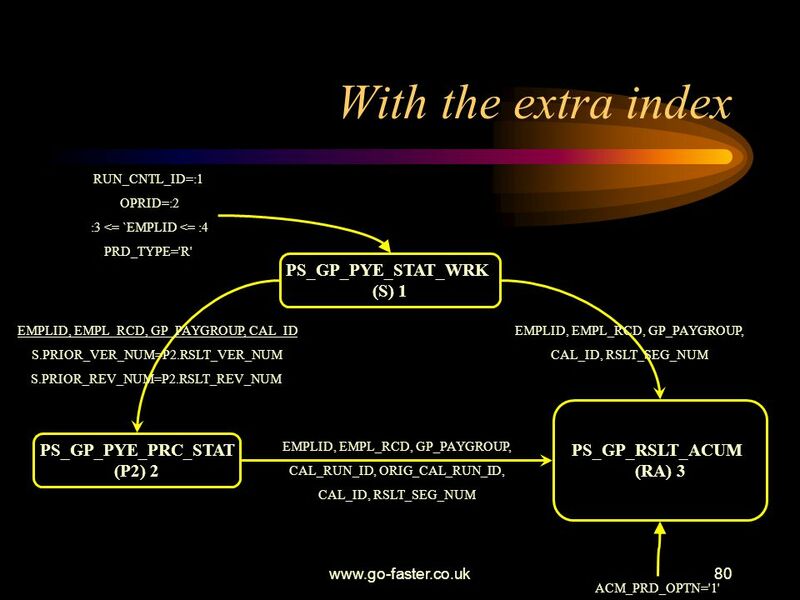 CREATE INDEX PSBITEM ON PS_ITEM (ITEM, CUST_ID, BUSINESS_UNIT, ITEM_STATUS) TABLESPACE PSINDEX STORAGE (INITIAL 10K NEXT 98K MAXEXTENTS 110 PCTINCREASE 0) / Add index Go-Faster Consultancy Ltd.
PP_METHOD <> ' ' EFFDT PS_CUST_OPTION (O) 6 PS_CUST_OPTION (O) PS_CUSTOMER (C) 5 PS_CUSTOMER (C) O.SETID = C.REMIT_FROM_SETID O.CUST_ID = C.REMIT_FROM_CUST_ID RECNAME = 'CUSTOMER' SETID CUST_ID PS_SET_CNTRL_REC (S) PS_SET_CNTRL_REC (S) 4 PS_ITEM (I) PS_ITEM (I) 3 S.SETCNTRLVALUE = I.BUSINESS_UNIT REF_QUALIFIER_CODE = 'I' X.REF_VALUE = I.ITEM I.ITEM_STATUS = 'O' PS_PAYMENT_ID_ITEM (X) PS_PAYMENT_ID_ITEM (X) 2 Although the SQL is now laid out in a easy to read format, it is still not clear what is going on. 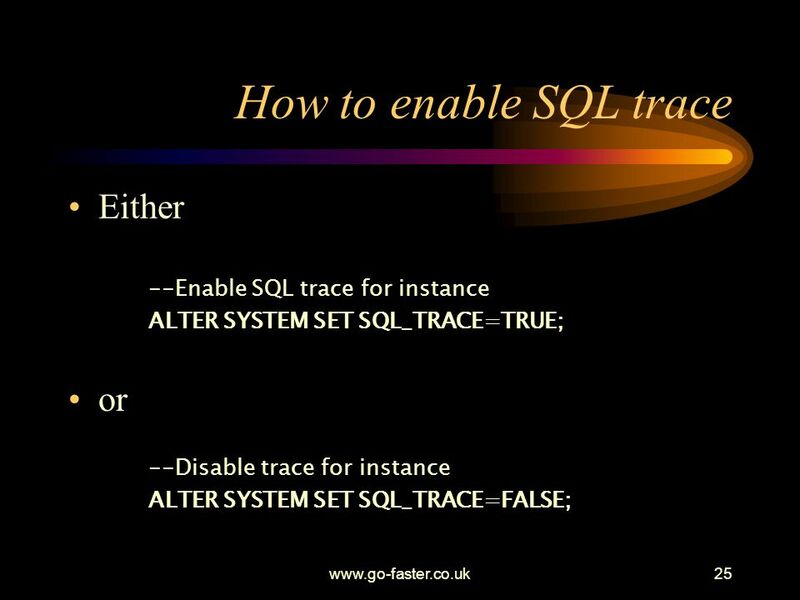 The following graphical technique may be used to illustrate the connections between tables made in the query. Start by simply putting the tables down. 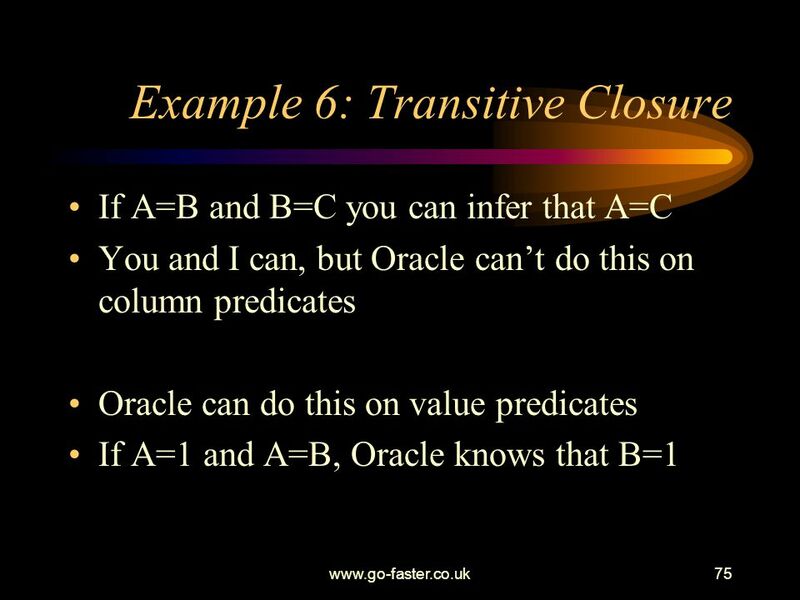 The order does not matter, but it helps if related tables are adjacent. This prevents a tangle of crossed lines later. P.DEPOSIT_BU = X.DEPOSIT_BU P.DEPOSIT_ID = X.DEPOSIT_ID P.PAYMENT_SEQ_NUM = X.PAYMENT_SEQ_NUM PS_PP_PAYMENT_TMP (P) PS_PP_PAYMENT_TMP (P) 1 PROCESS_INSTANCE = 212 Go-Faster Consultancy Ltd.
call count cpu elapsed disk query current rows Parse Execute Fetch total After Parse Execute total The improvement in the execution time of the step is dramatic. Go-Faster Consultancy Ltd.
60 Example 2: Wait Events How do you know it’s not the database? Event 10046,8 – enable wait information. 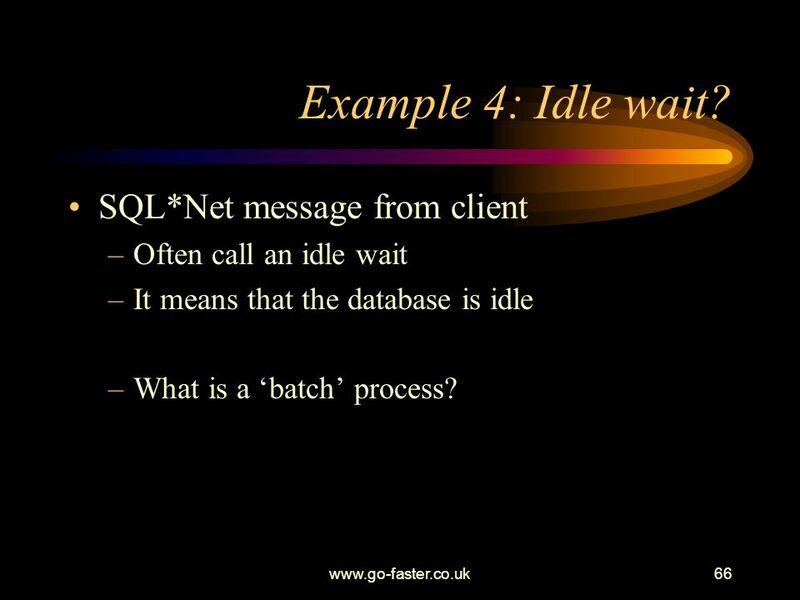 Often call an idle wait It means that the database is idle What is a ‘batch’ process? 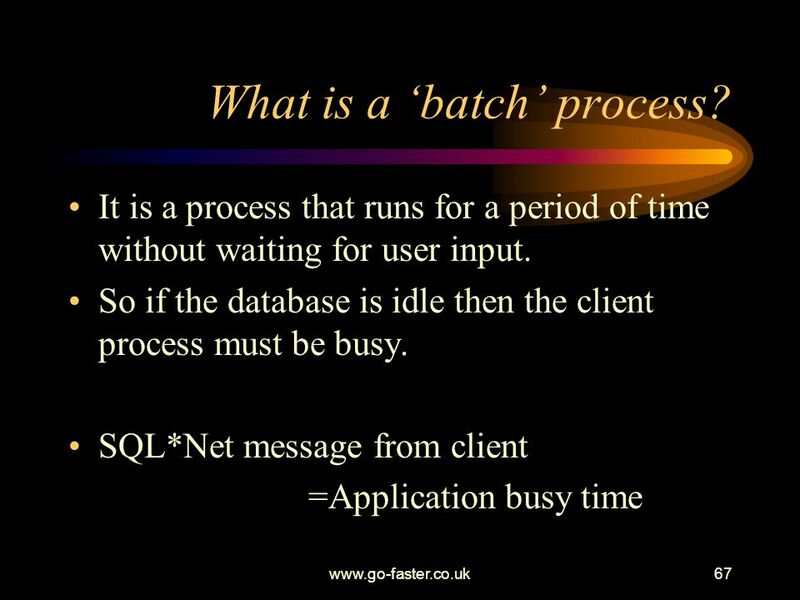 67 What is a ‘batch’ process? 70 Is it the database? 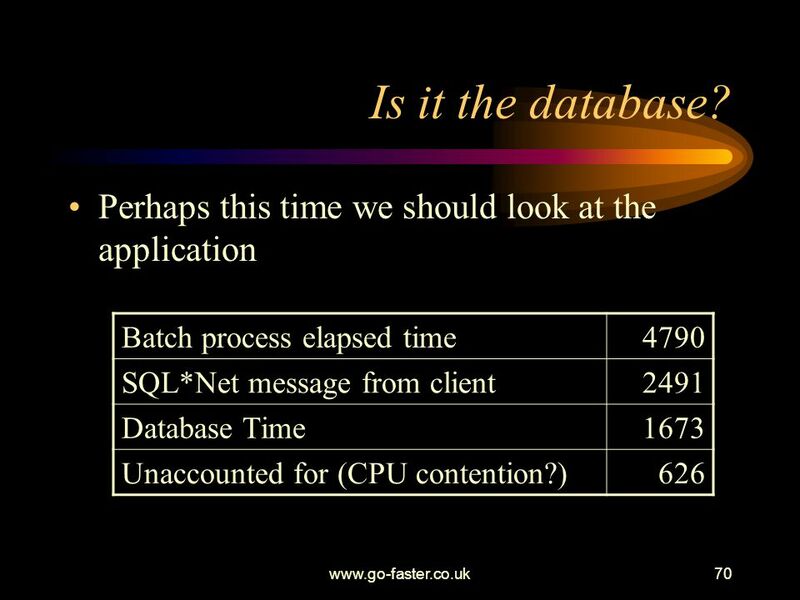 Perhaps this time we should look at the application Batch process elapsed time 4790 SQL*Net message from client 2491 Database Time 1673 Unaccounted for (CPU contention?) 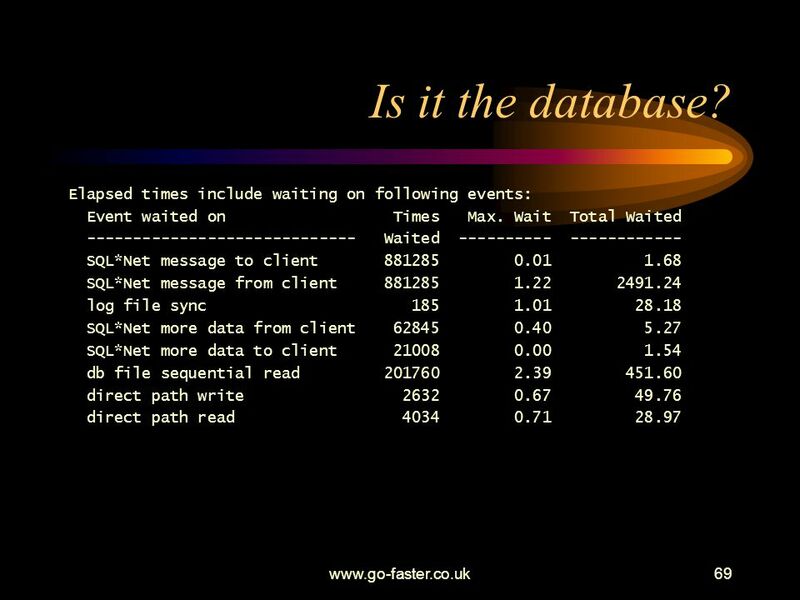 626 Batch 4790s SQL*Net message from client 2491s Database CPU Contention? Go-Faster Consultancy Ltd.
IDENTIFY YOUR BOTTLENECKS SQL Trace What to trace, How to enable, What’s in it? Tkprof What can it tell you? When does it mislead? 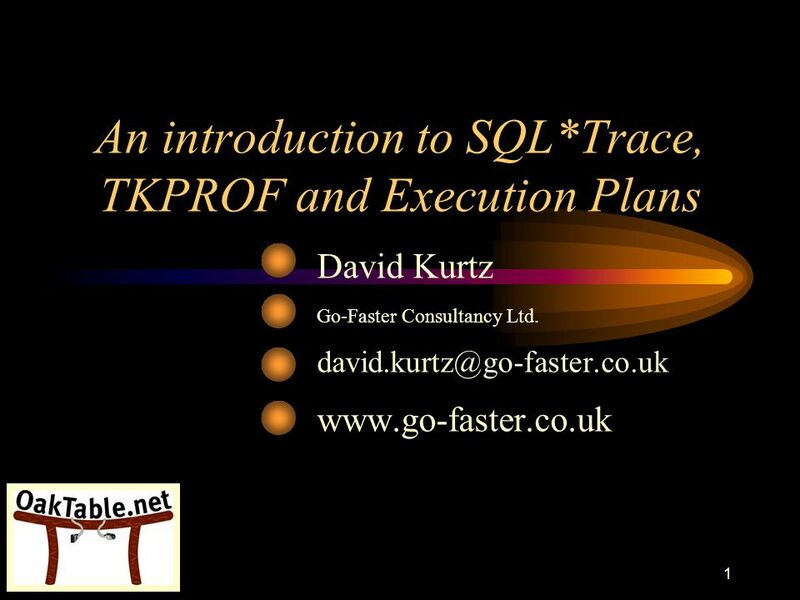 David Kurtz Go-Faster Consultancy Ltd. Go-Faster Consultancy Ltd.
Download ppt "An introduction to SQL*Trace, TKPROF and Execution Plans"
CHAPTER 4 Tablespaces and Datafiles. Introduction After installing the binaries, creating a database, and configuring your environment, the next logical. Why is that LOV in the screen not returning me desired value? 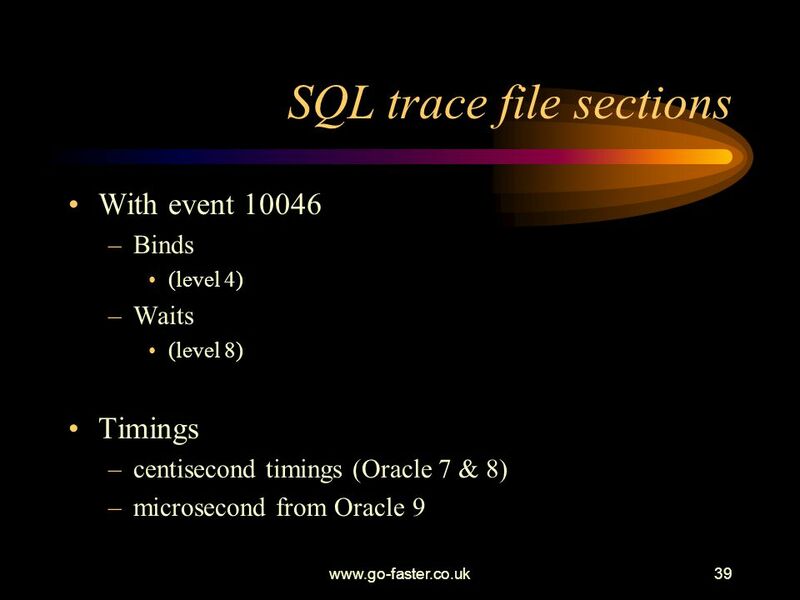 Oracle Server Tuning Accelerator David Scott Intec. Copyright © 2013, Oracle and/or its affiliates. 1. 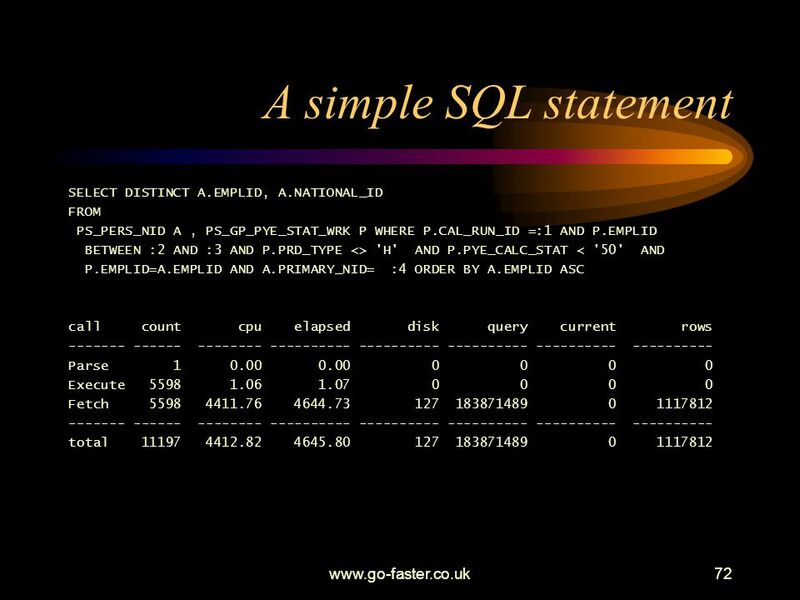 UKOUG DBMS SIG www.go-faster.co.uk1 Materialized Views: Simple Replication? 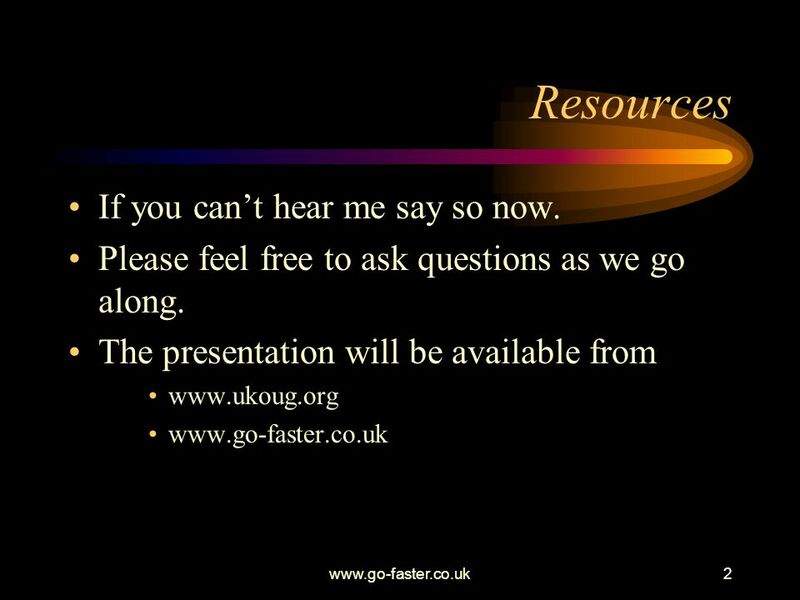 David Kurtz Go-Faster Consultancy Ltd. Global Payroll Performance Optimisation - I David Kurtz Go-Faster Consultancy Ltd.
1 PeopleSoft for the DBA David Kurtz Go-Faster Consultancy Ltd.
PIA Load Balancing, JVMs and Garbage Collection David Kurtz Go-Faster Consultancy Ltd.
Oracle PL/SQL IV Exceptions Packages. 1 Wait Event Enhancements in Oracle 10g Terry Sutton and Roger Schrag Database Specialists, Inc. 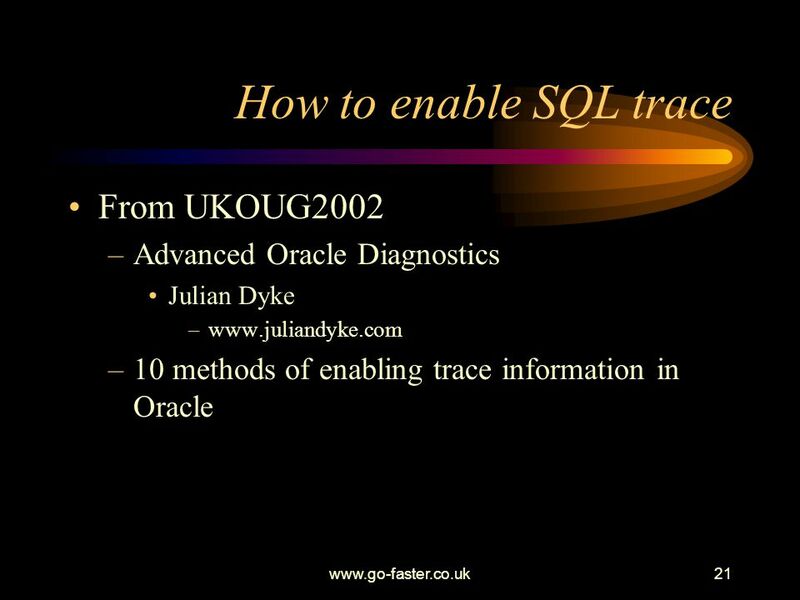 Dynamic SQL Writing Efficient Queries on the Fly ED POLLACK AUTOTASK CORPORATION DATABASE OPTIMIZATION ENGINEER.